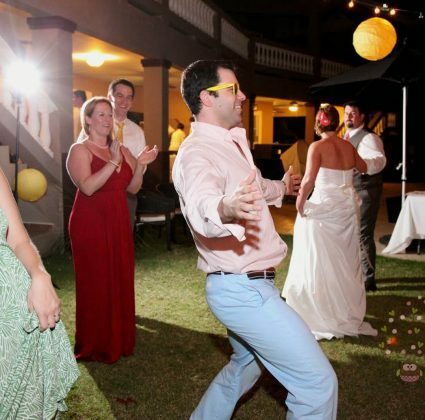 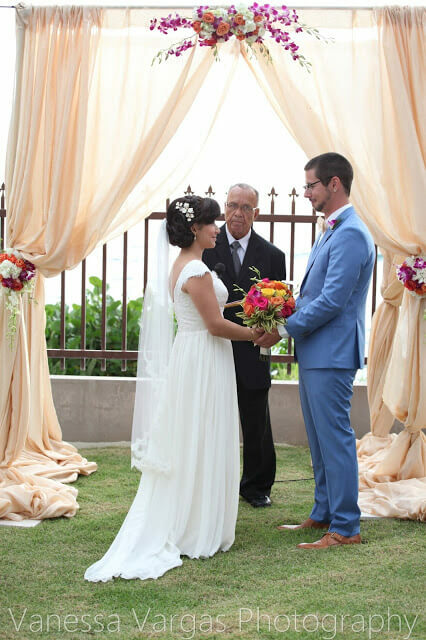 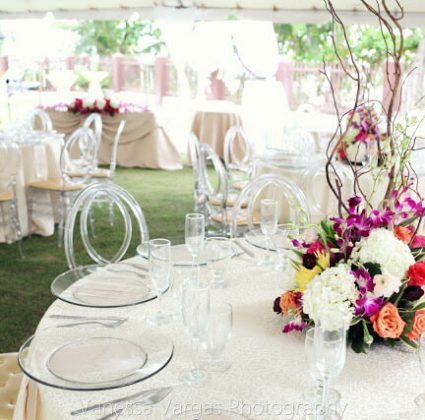 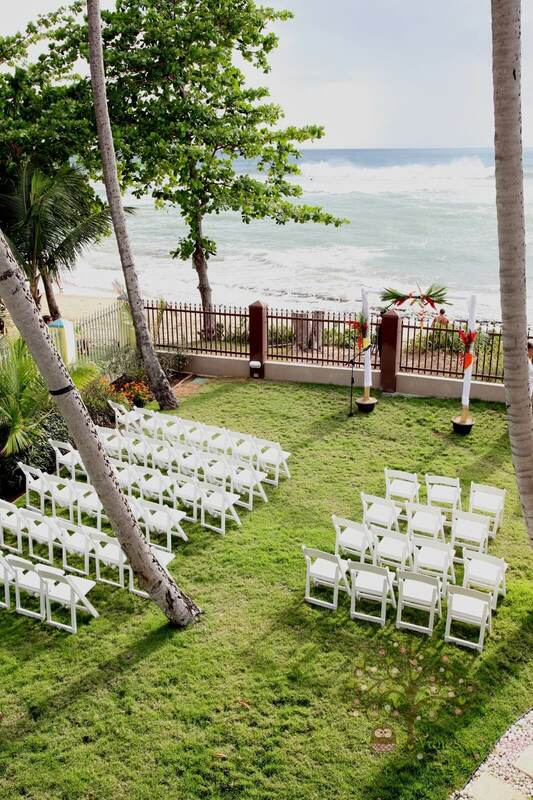 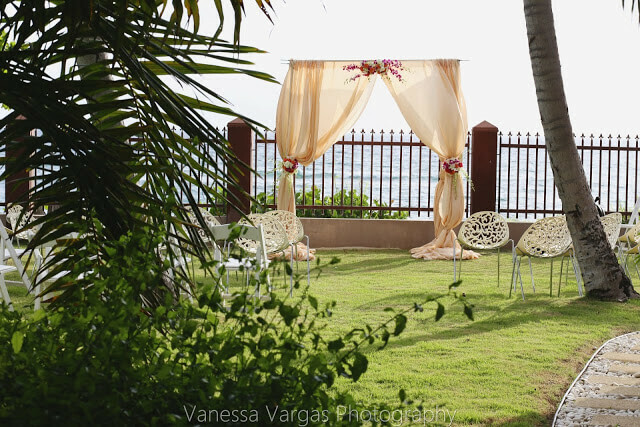 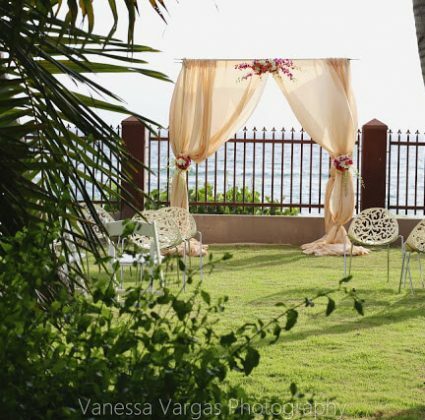 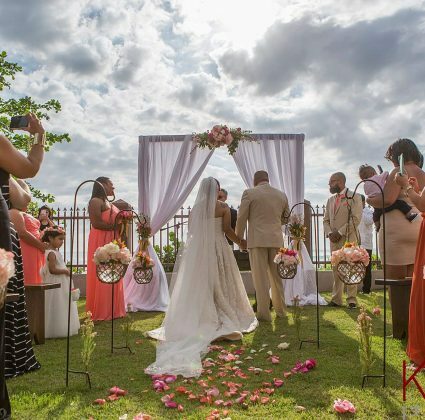 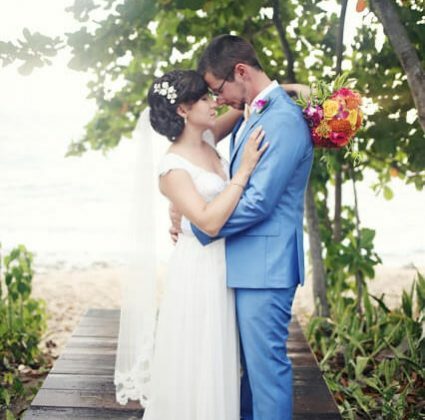 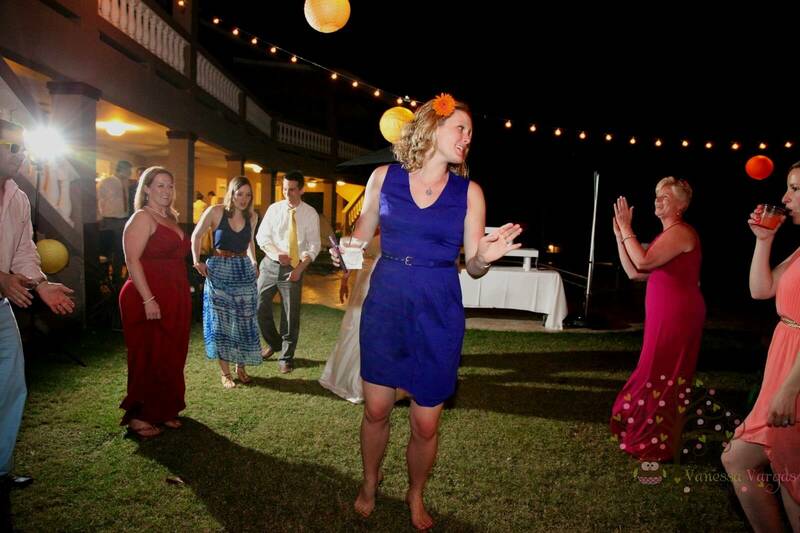 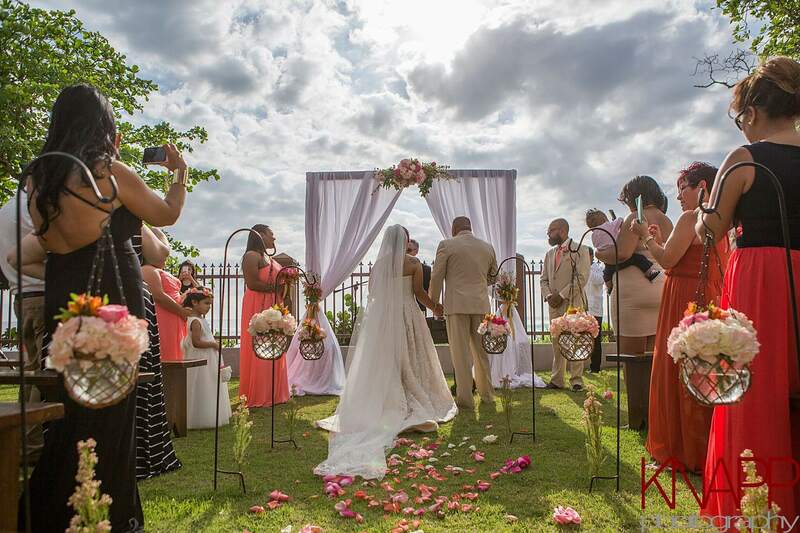 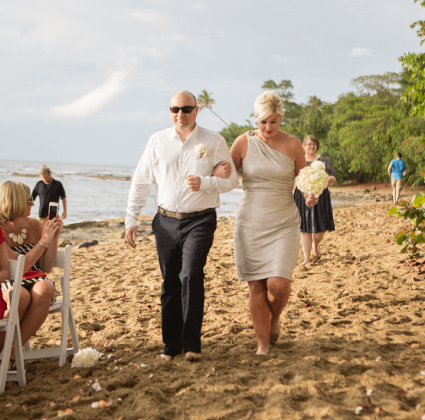 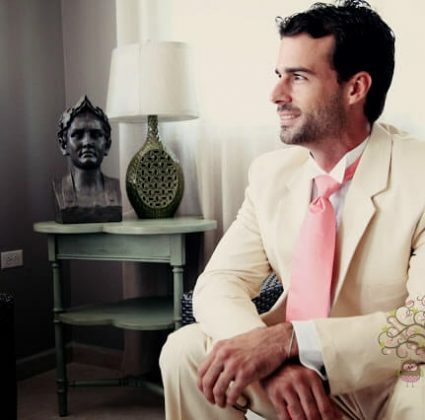 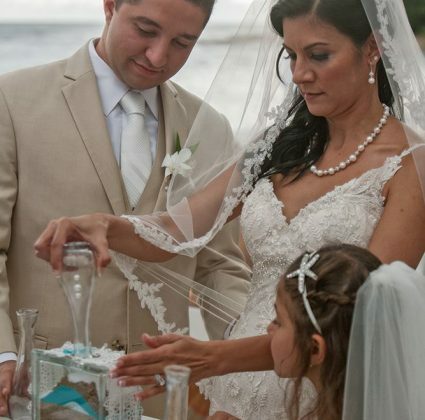 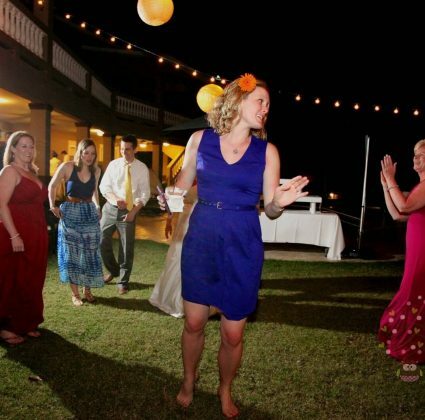 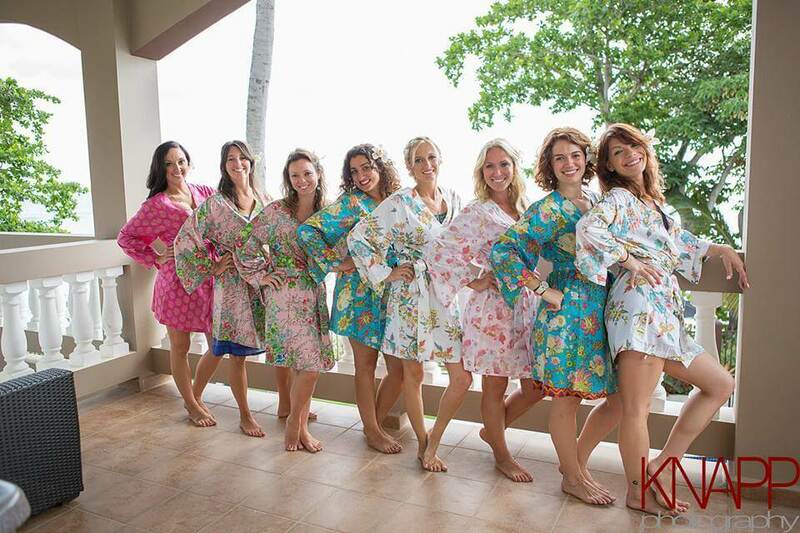 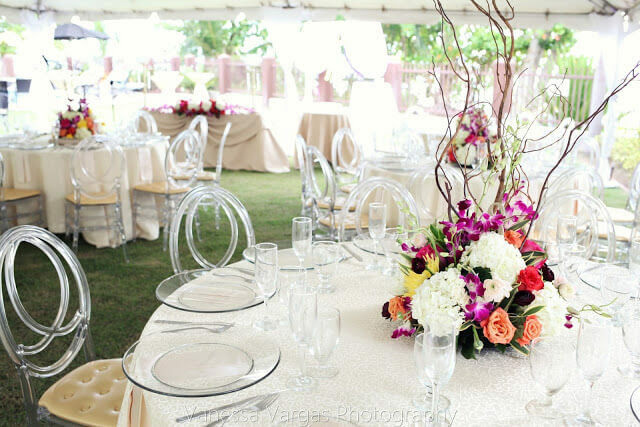 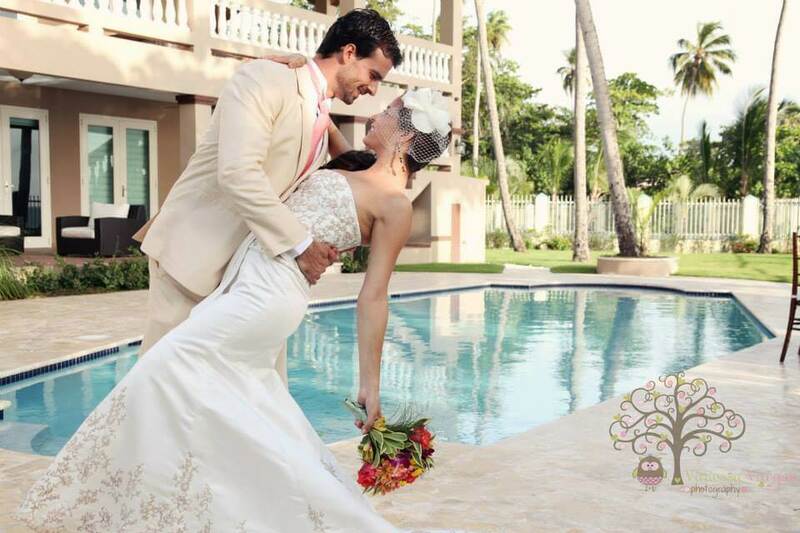 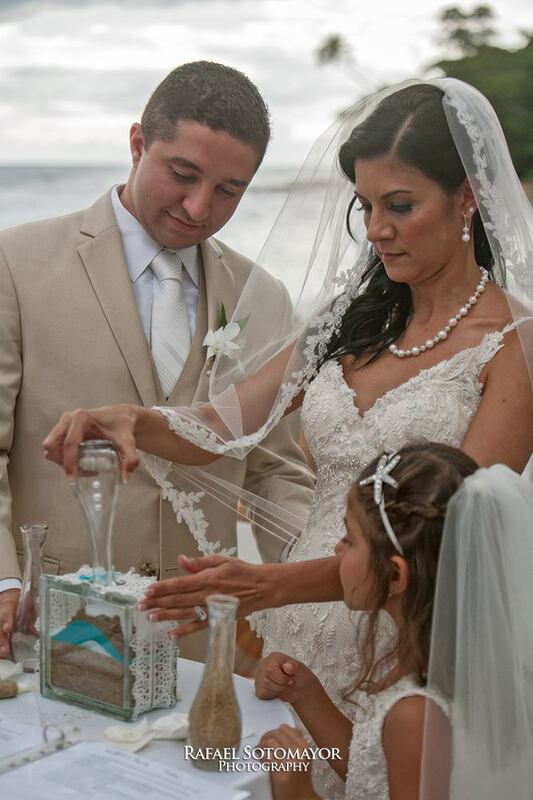 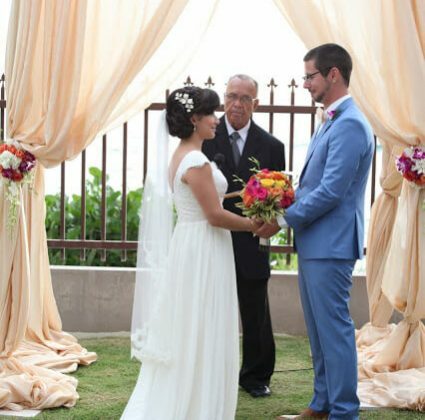 Have you always dreamed of planning a wedding on the sunny shores of Puerto Rico? 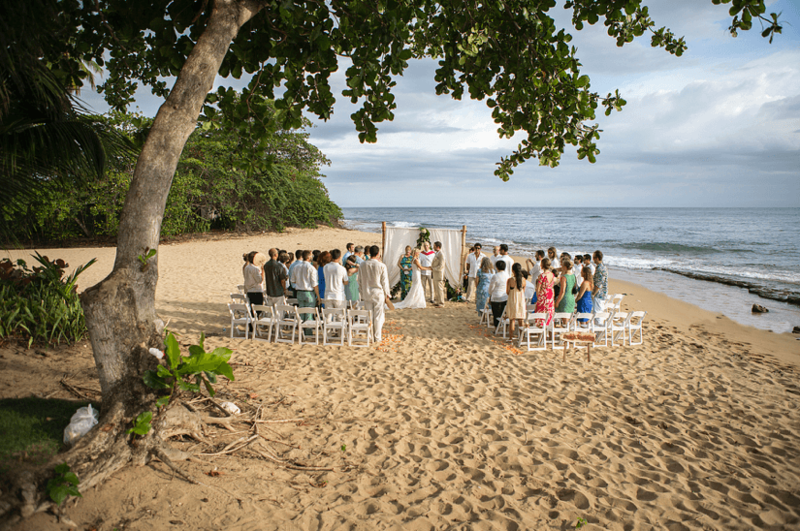 There is a lot of planning that goes into a destination wedding, from organizing travel plans for yourself, your families and your wedding party, to choosing the perfect location. 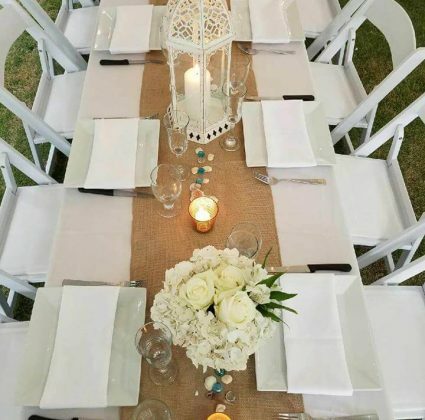 But what about the tiny details that can get overlooked, but are essential for making the day perfect? 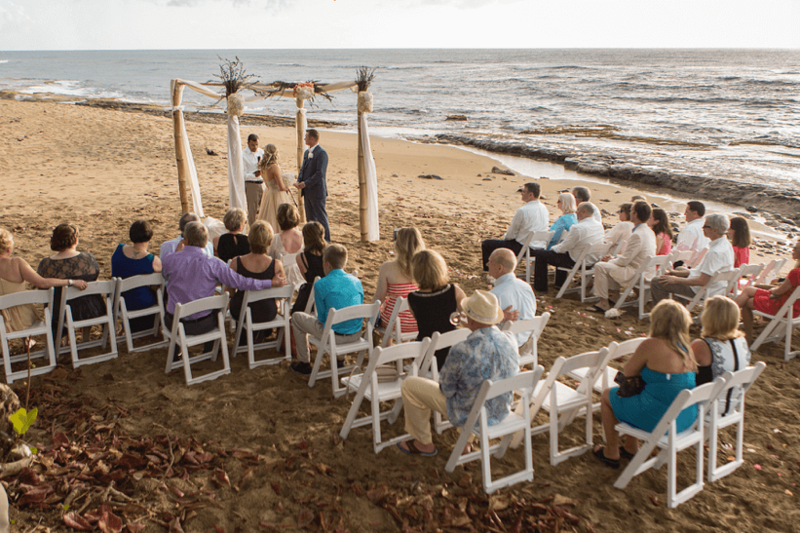 Here are seven ways you can make your beach wedding memorable, beautiful and what you’ve always hoped for. 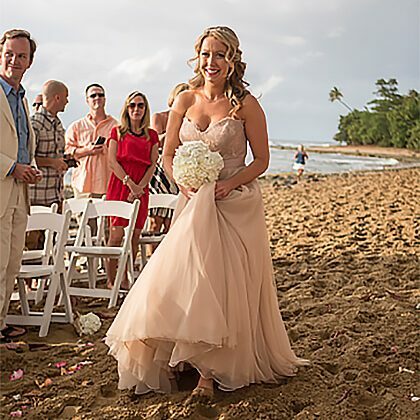 Say Yes to Simpler Dress: When purchasing your wedding dress, keep in mind that less is more when it comes to a beach wedding. 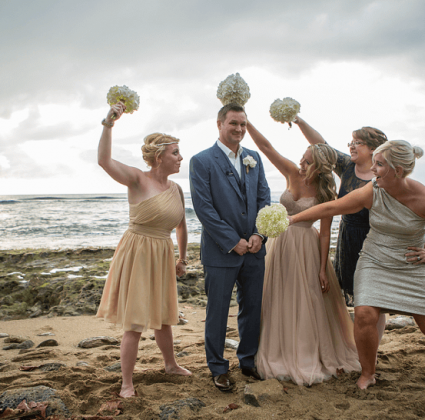 Large, poufy dresses will not only be uncomfortable on the beach, but they also won’t mesh well with the natural setting. 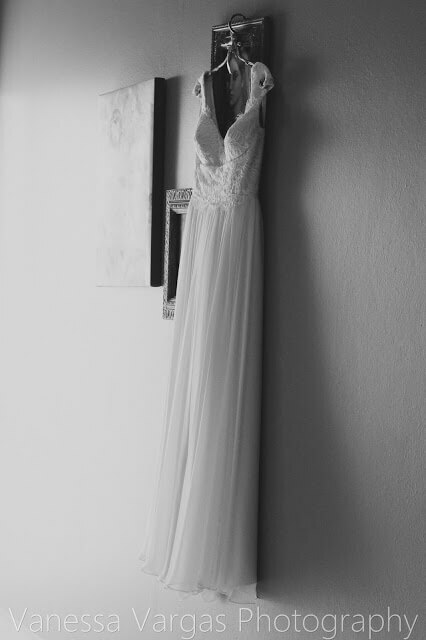 Choose a flowing dress in a lightweight fabric for best results. 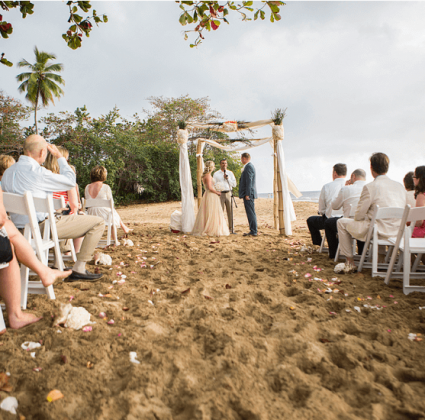 High heels can be problematic while waling through sand, too. 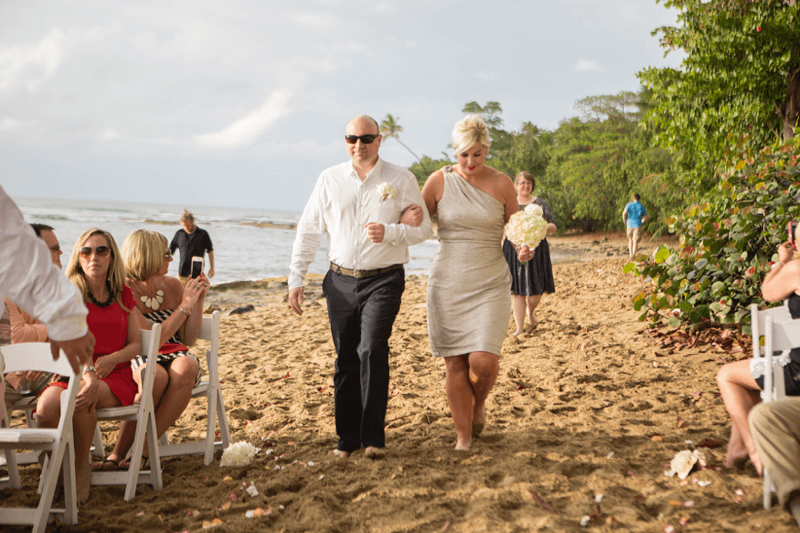 Sandals or espadrilles are a better option. 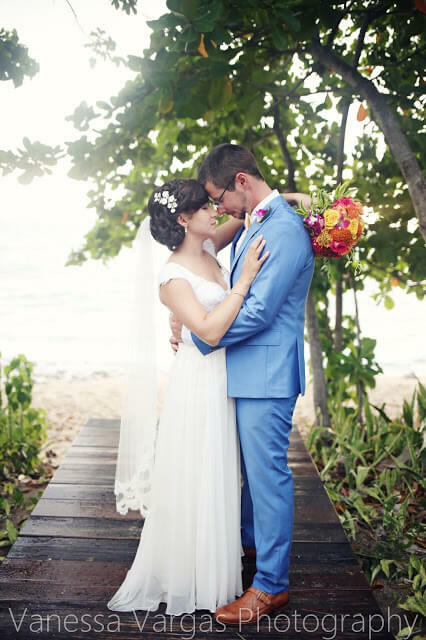 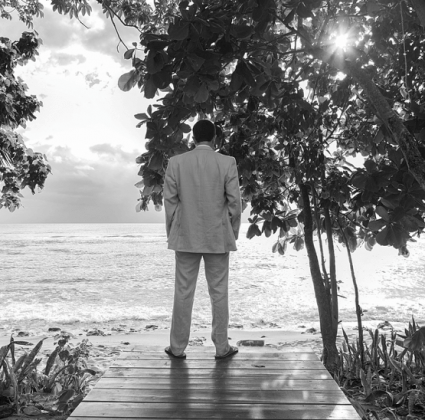 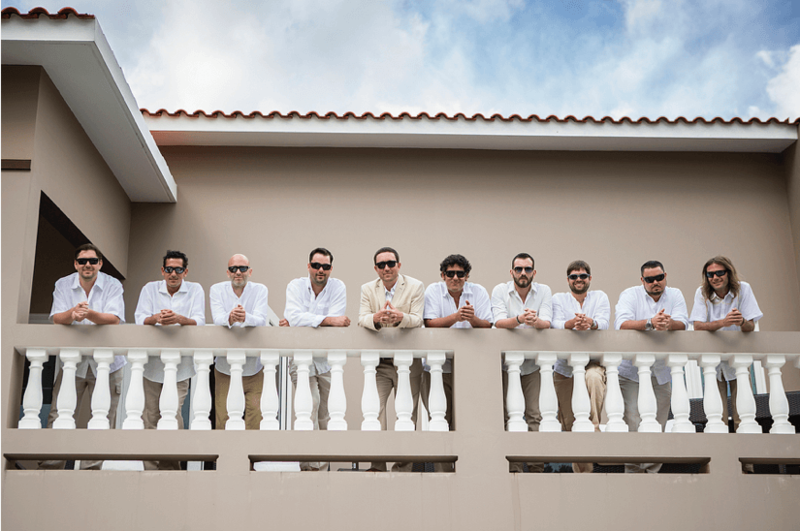 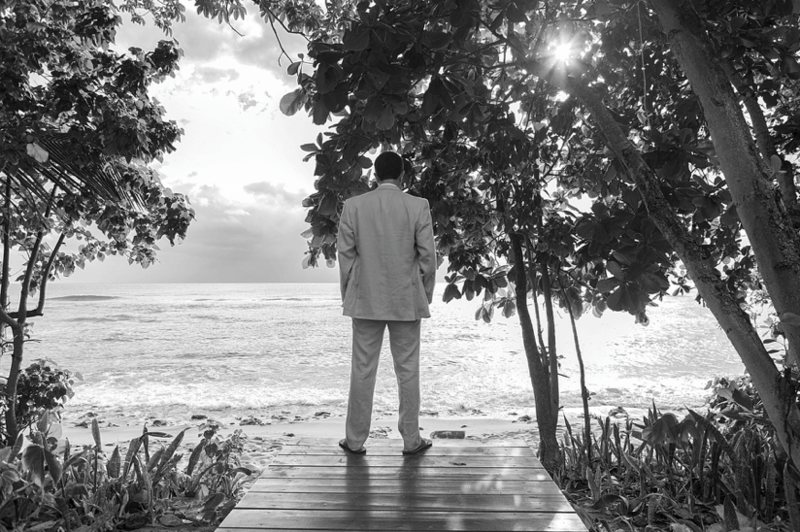 For the men, casual is best, because woolen tuxes and tropical locales don’t mix! 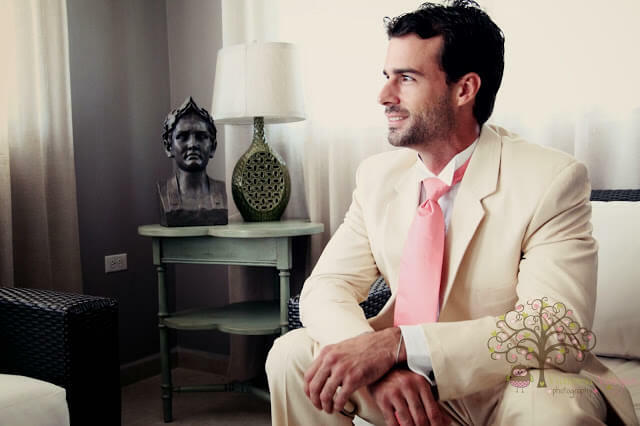 Lightweight cotton or linen clothing is a better option. 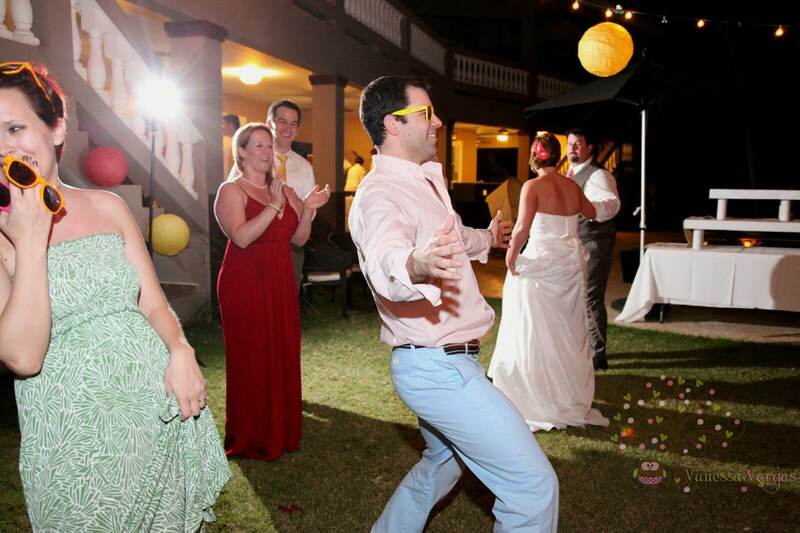 Get Your Guests Swag: Swag bags, that is. 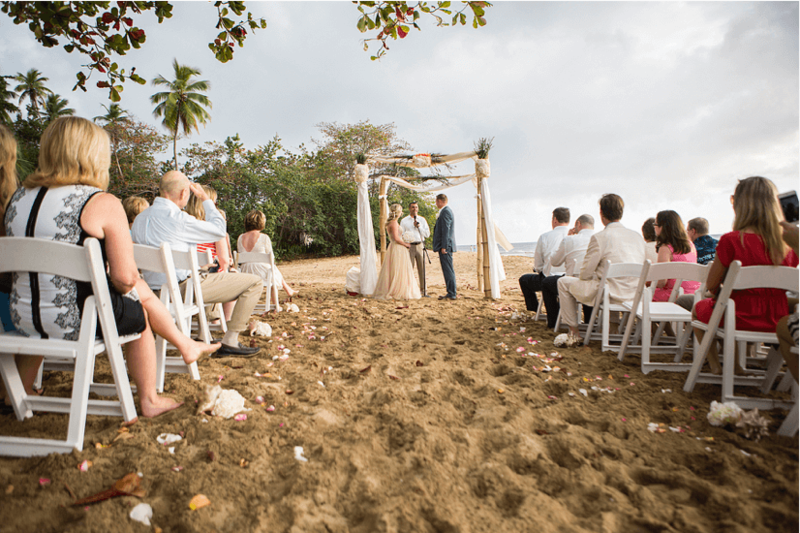 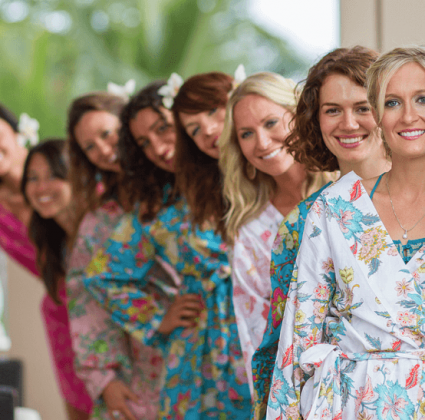 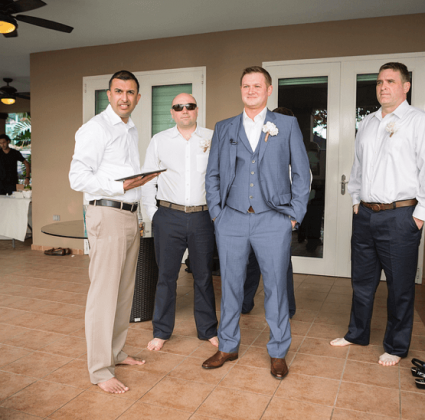 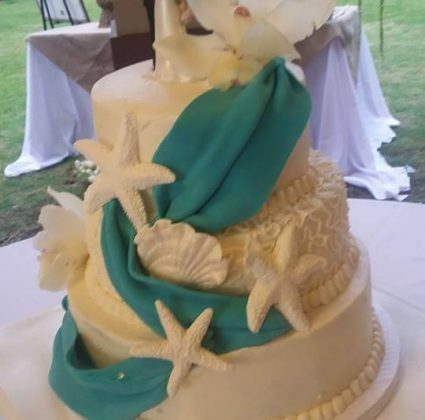 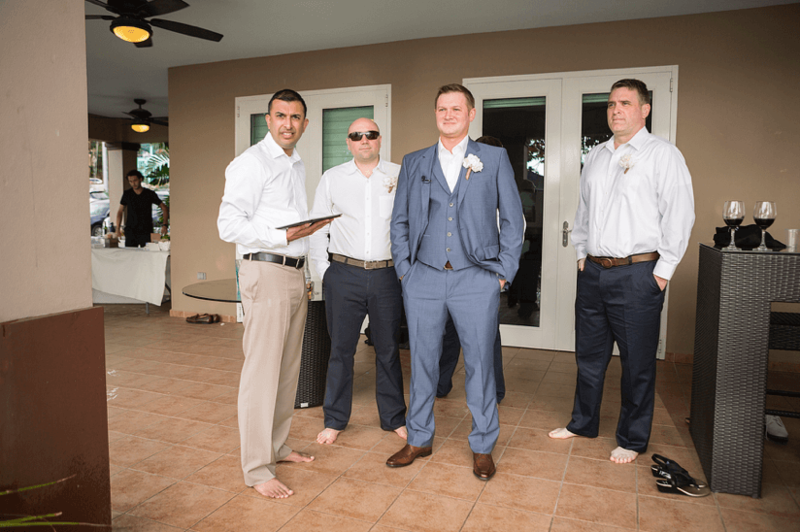 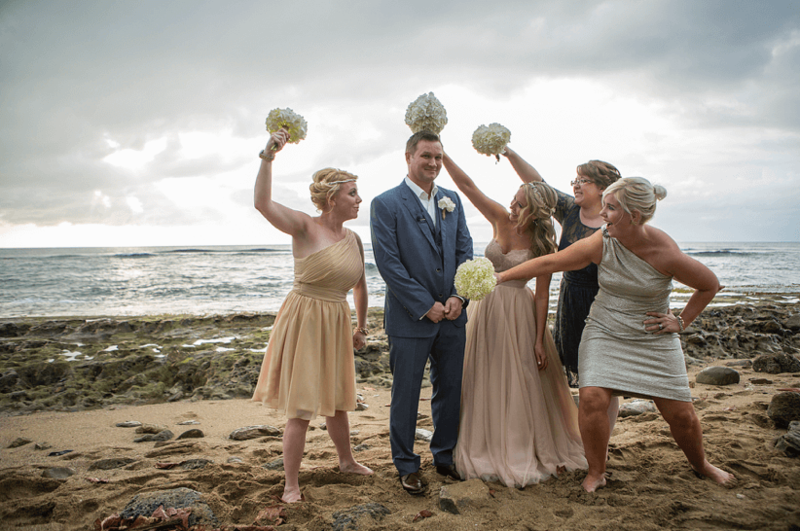 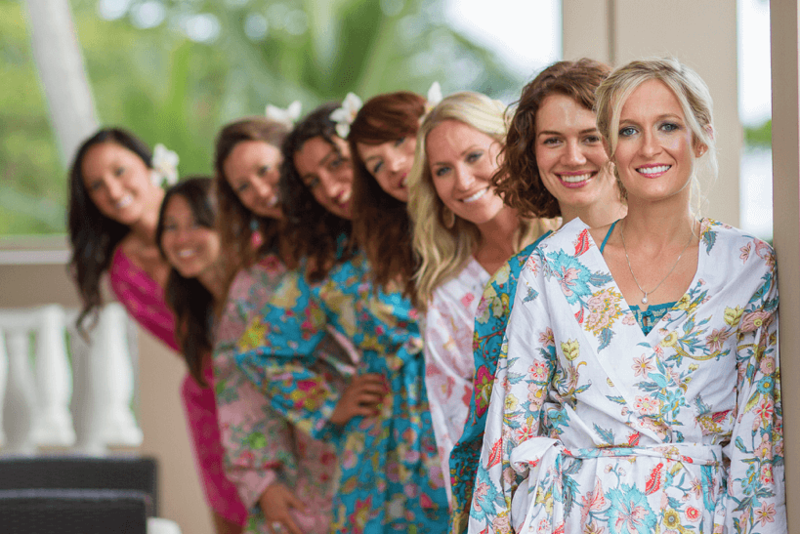 You’ll want to prepare your guests for your beach wedding in advance, so that they, too, can make sure they have the proper attire for the conditions. 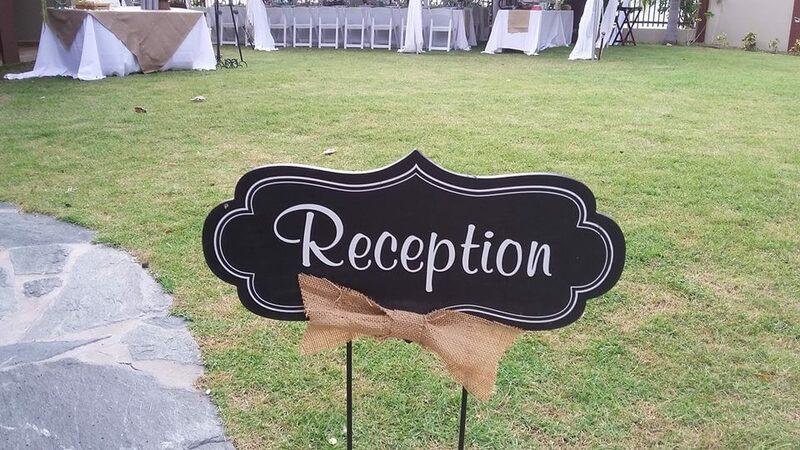 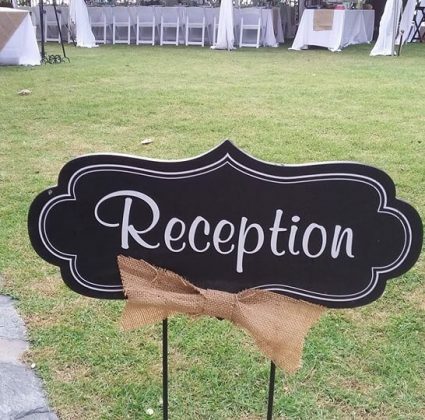 Organize your welcome bags with items that will likely come in handy for your guests during the ceremony, including bottled water, hand fans, pre-moistened towelettes, insect repellant and sunscreen. 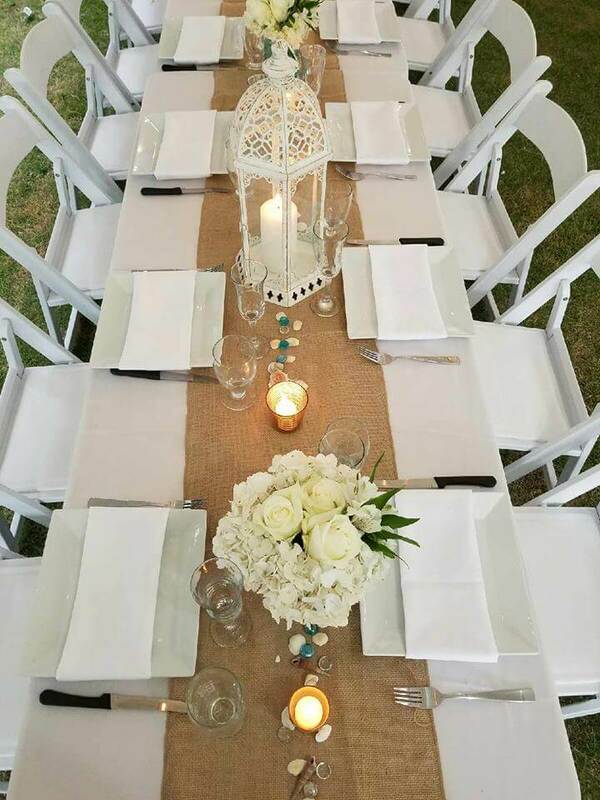 And, make sure you have a shaded area with additional beverages such as water and lemonade available, so your guests can stay refreshed. 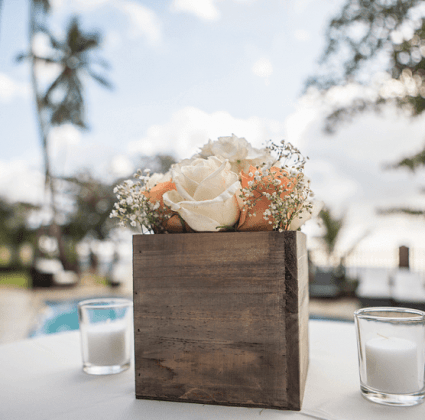 Act Naturally: You already have a beautiful beach and the clear blue ocean as your scenery, so keeping your décor natural is a good idea. 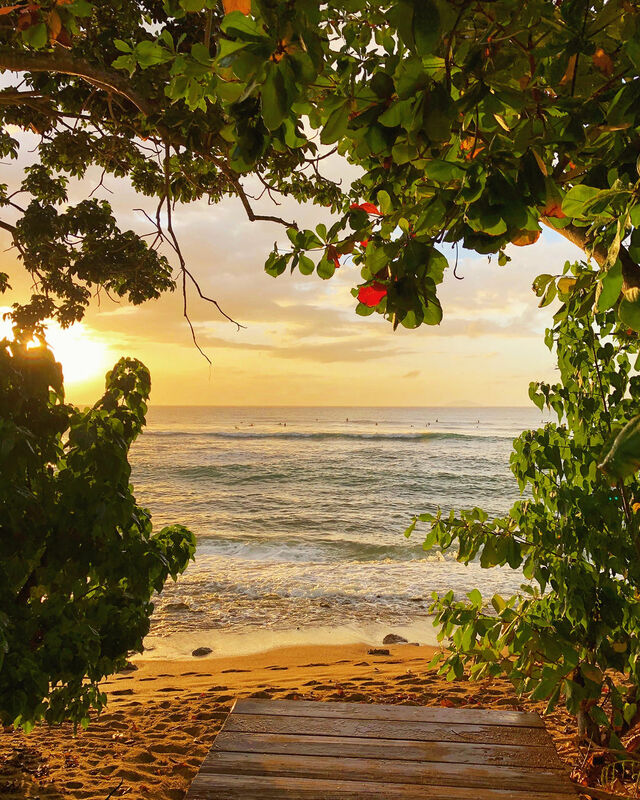 Consider the colors of the flora of the beach, like the sand, grasses, seashells, and the water itself, and make your color scheme harmonize. 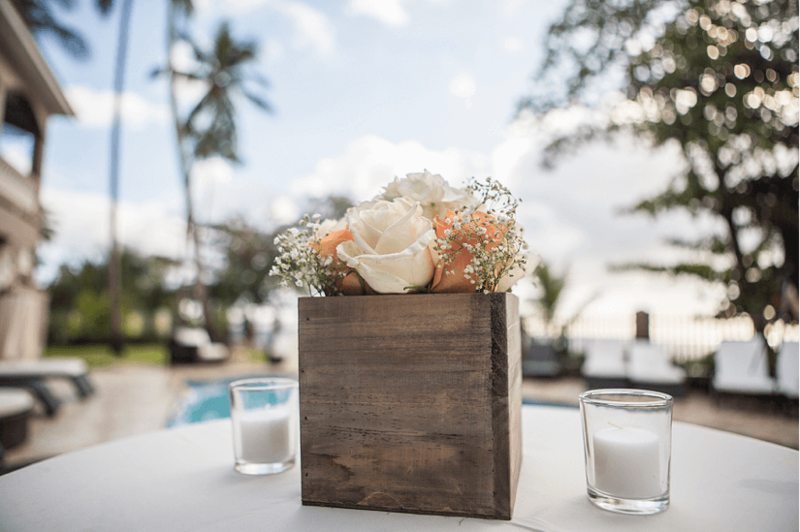 Choose flowers that provide a contrast to the landscape, but stay within the beachy palette and consider bold corals, bright blues and vibrant greens. 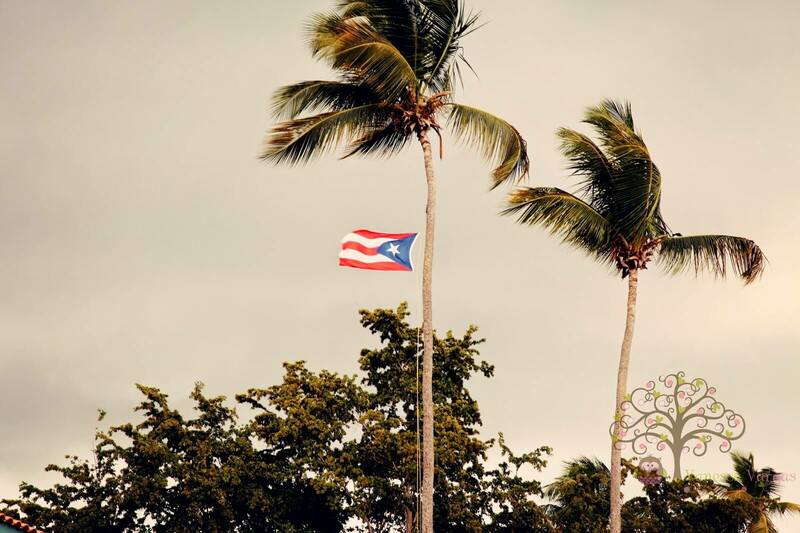 Everyone Knows it’s Windy: Beaches are, by nature, windy. 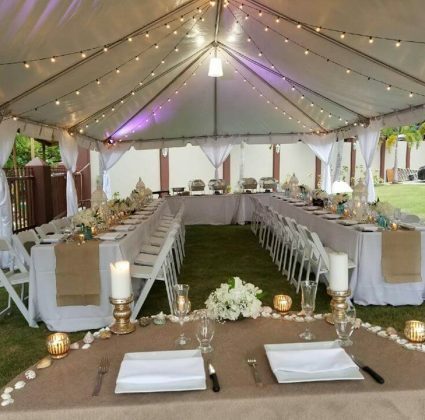 You’ll need to make sure any tents, signage, sheets of paper – basically anything that can blow away – are somehow secured. 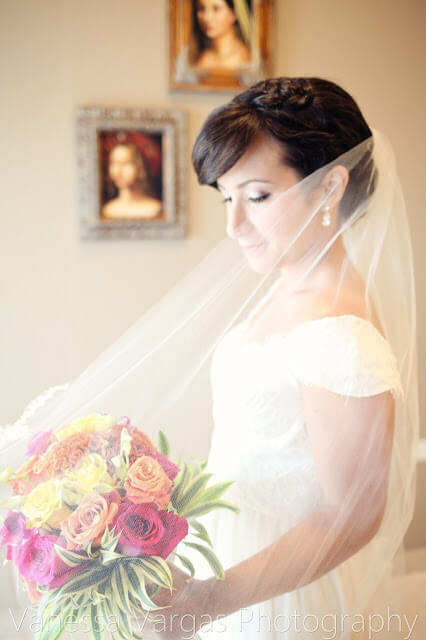 This goes for the bridal veil too! 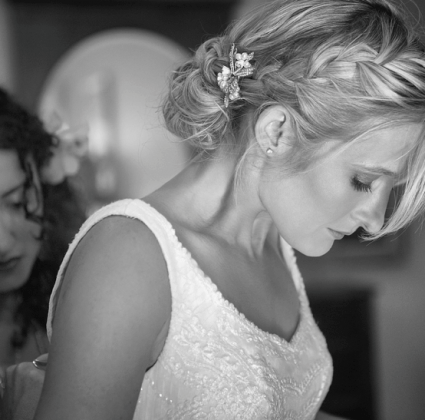 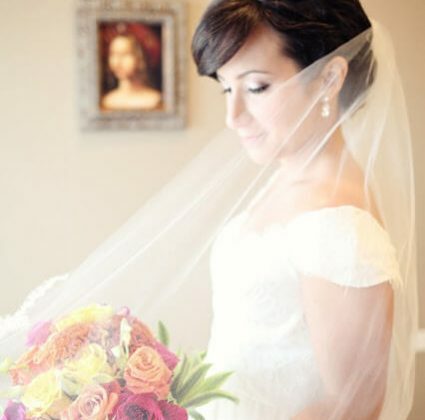 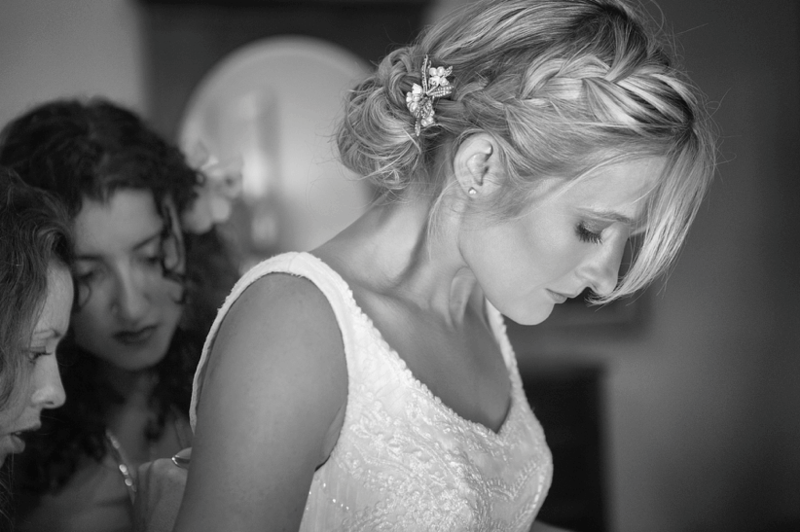 In fact, you probably will want to do away with a veil altogether, and opt for an up-do or upswept hairstyle for the day, so your hair isn’t blowing in your face constantly. 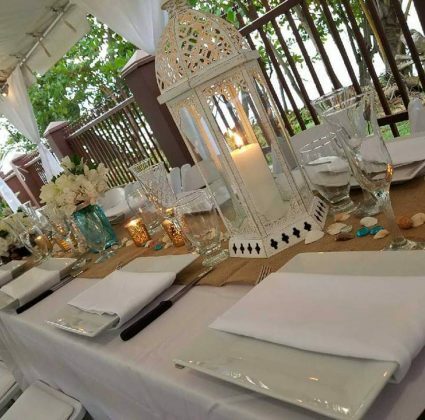 Keep in mind, glass vases can easily blow over and shatter, and candles will easily blow out, so think of ways to achieve the same effect with other objects (like heavier metal vases and LED flameless candles). 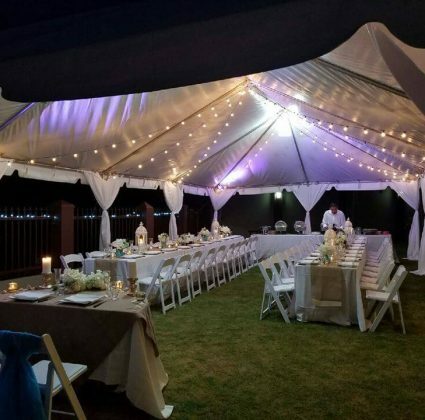 The wind can also make it difficult for your guests to hear, so make sure you either speak loudly or are wired for sound. 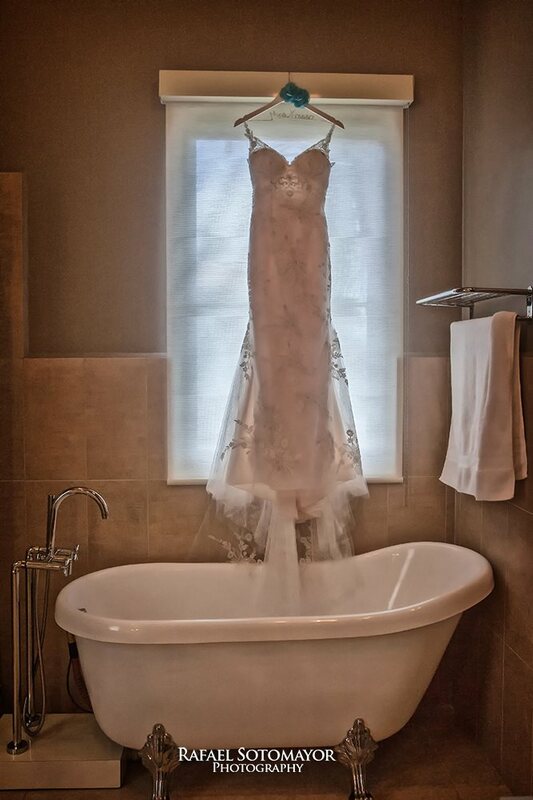 Oh What a Relief It Is: …to have a bathroom when you need one! 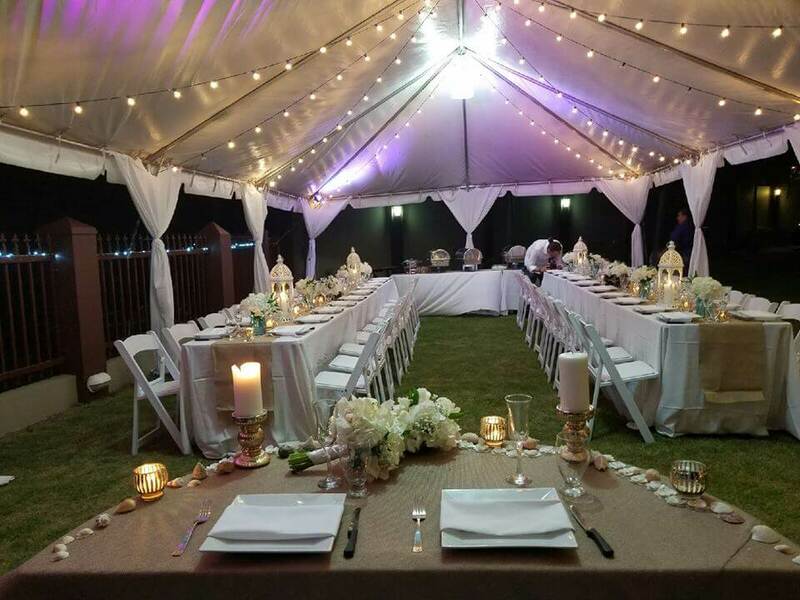 Make sure the area where you’re planning your wedding and reception have a restroom facility your guests can use, and if not, plan accordingly. 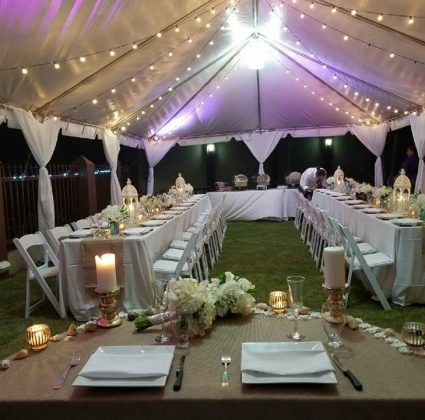 You don’t have to opt for a less-than-ideal port-a-potty setup, though. 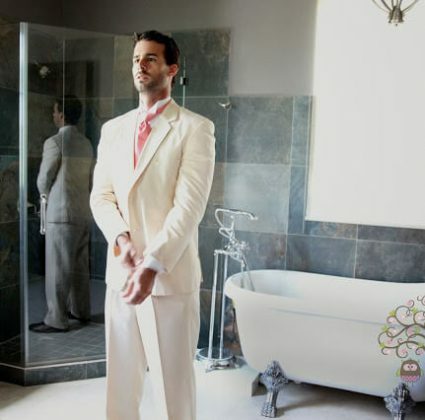 Nowadays, there are portable luxury bathroom options available. 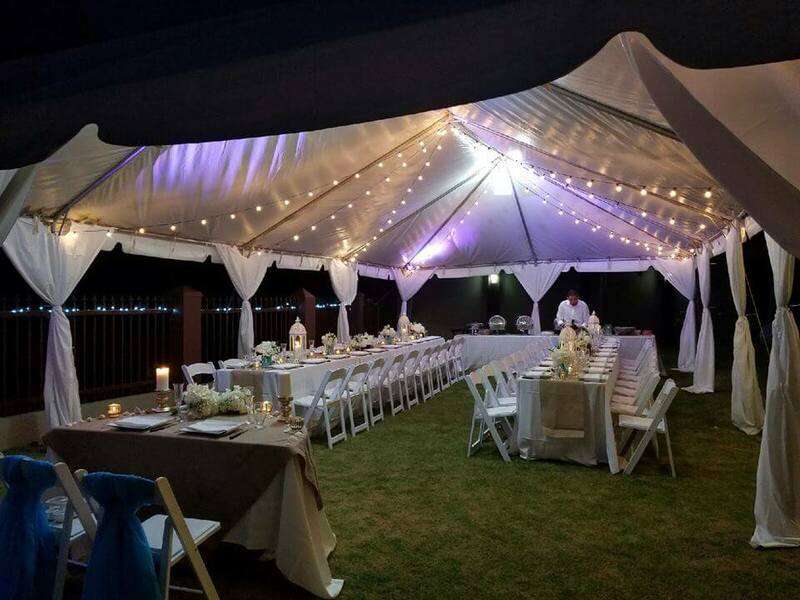 These restrooms are set up in a portable trailer-type unit, many times with multiple stalls and a hand washing station. 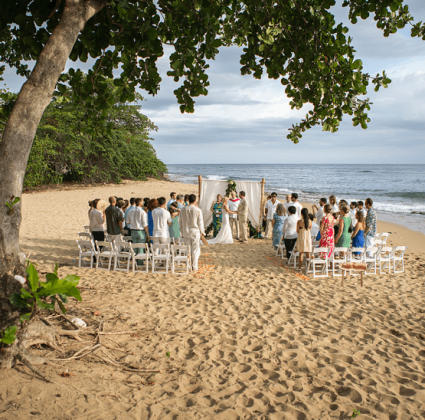 The Best-Laid Plans: Planning is incredibly important when it comes to having the beach wedding of your dreams. 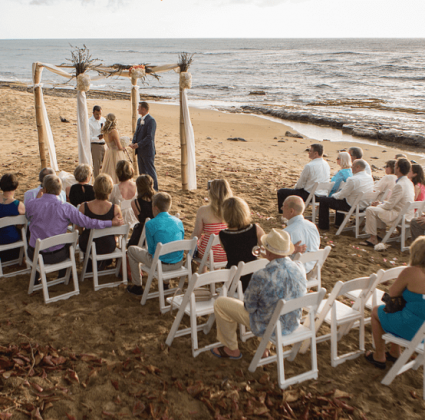 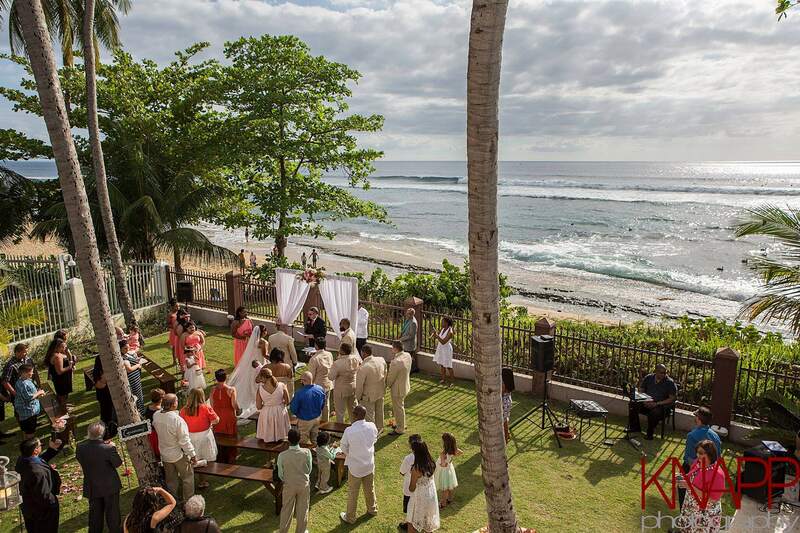 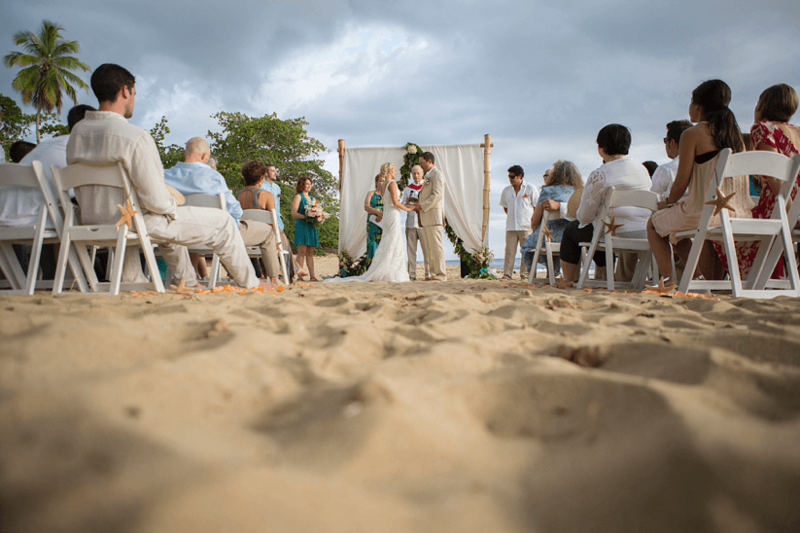 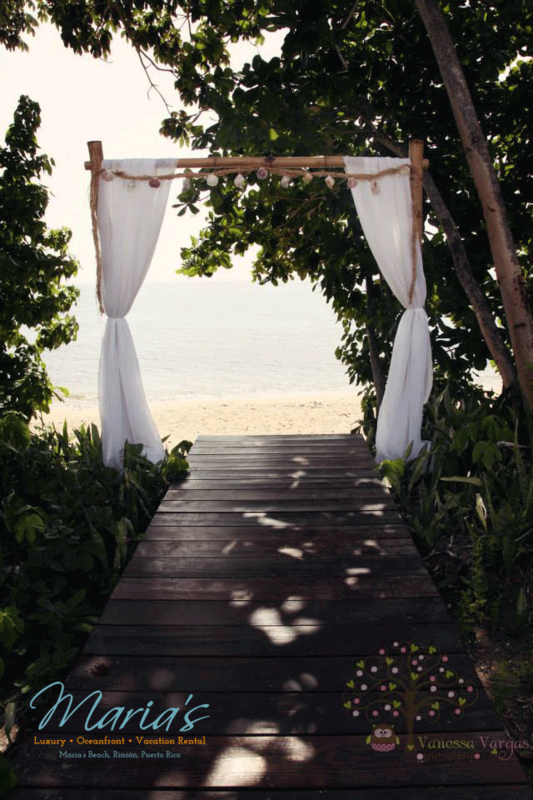 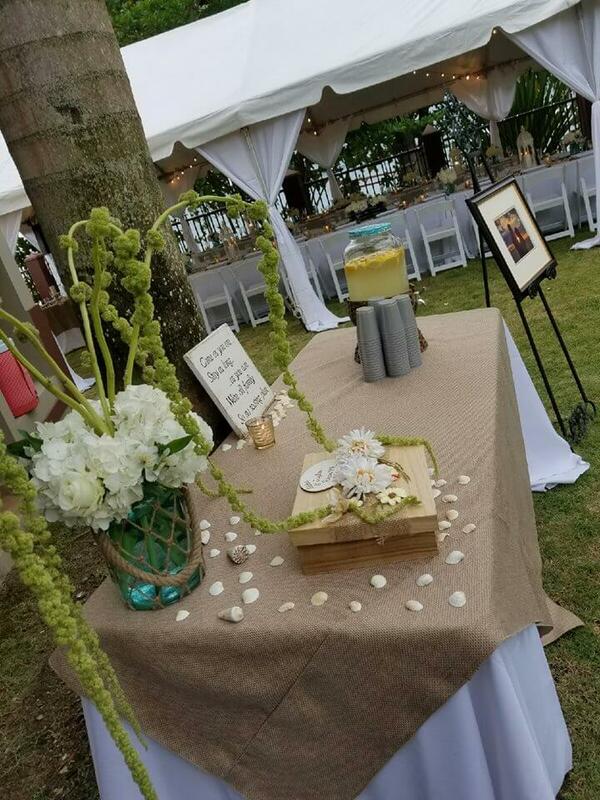 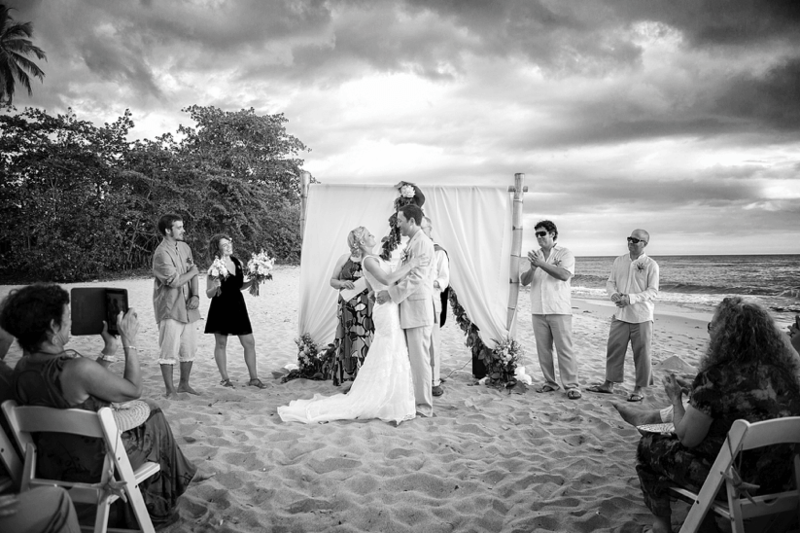 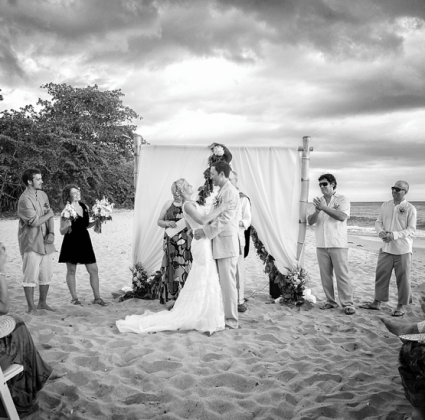 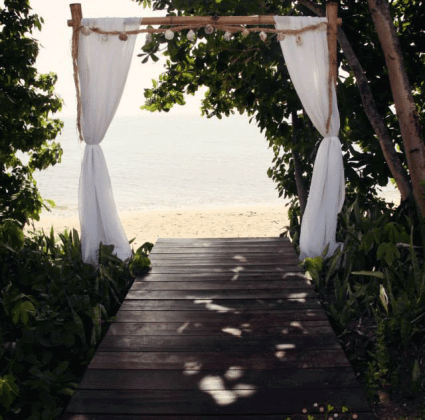 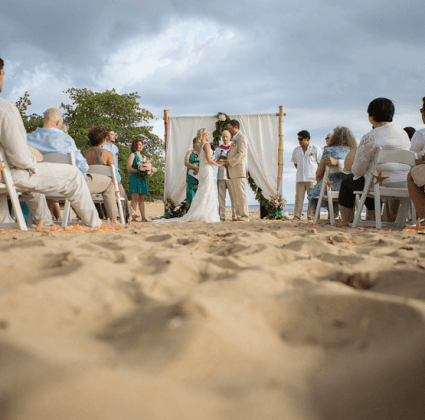 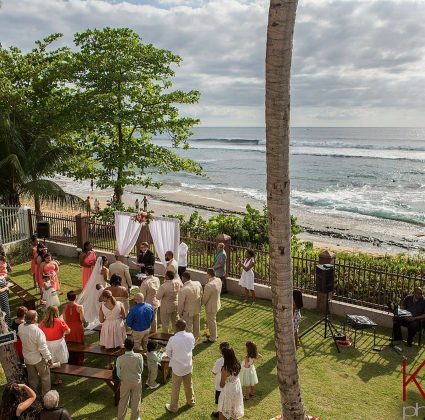 Some locales require that you have a permit so that you can hold your ceremony on the beach. 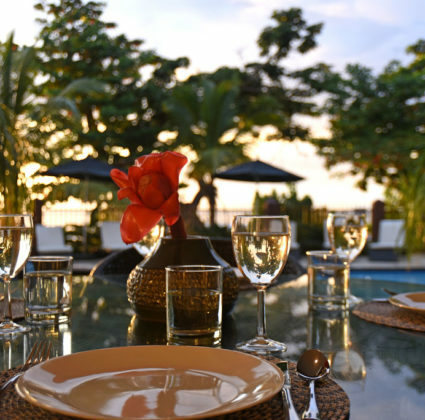 You’ll want to make sure you follow all local laws, such as food permits and noise ordinances. 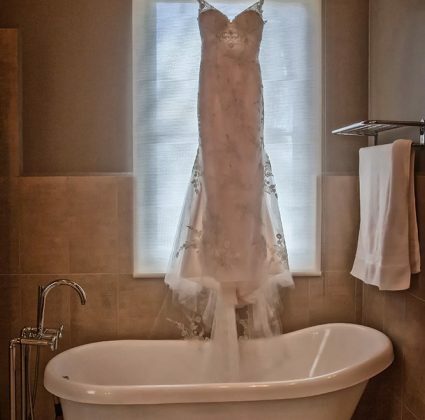 And, plan for privacy. 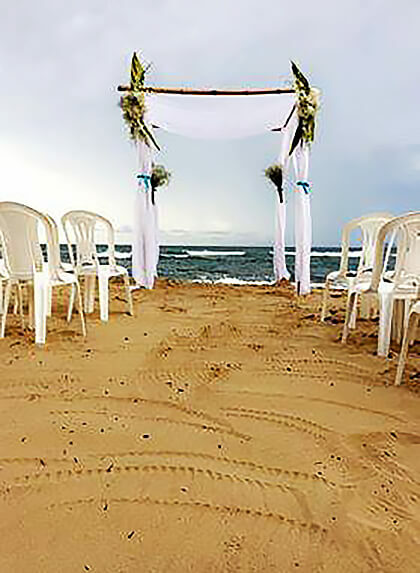 If your wedding is taking place on a public beach, know that holidays and weekends equal crowds. 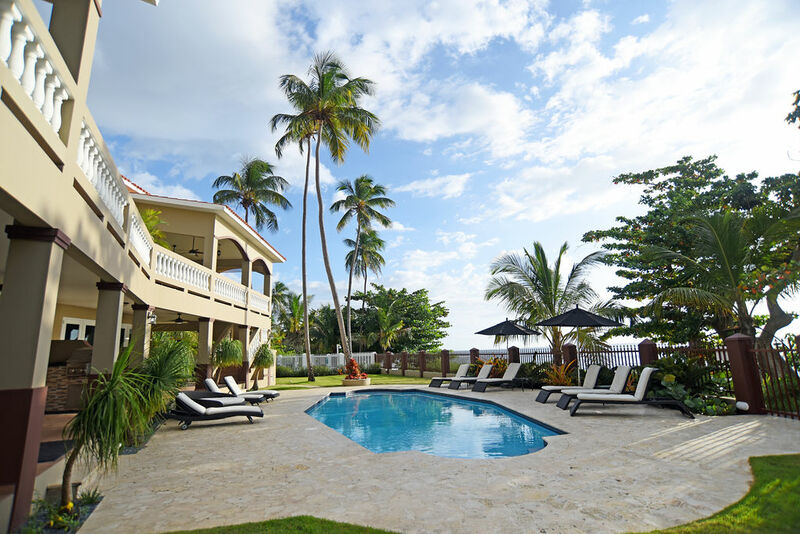 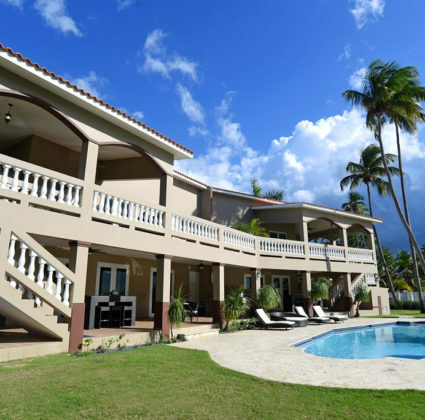 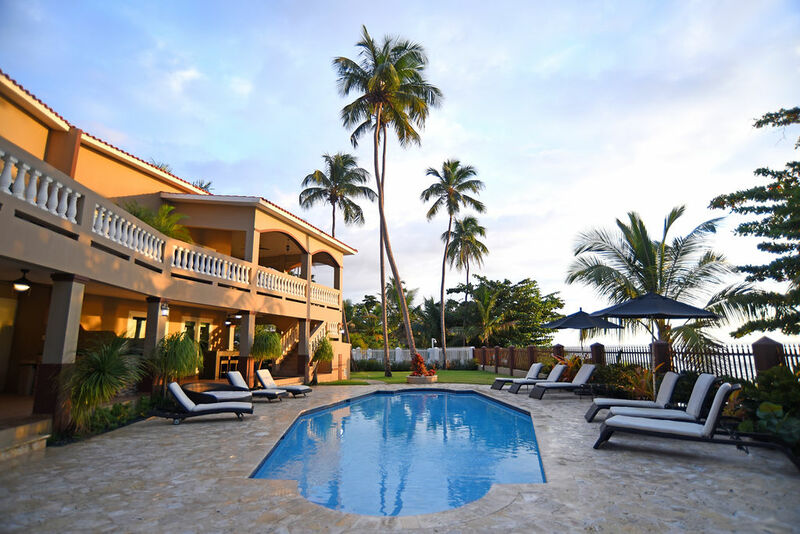 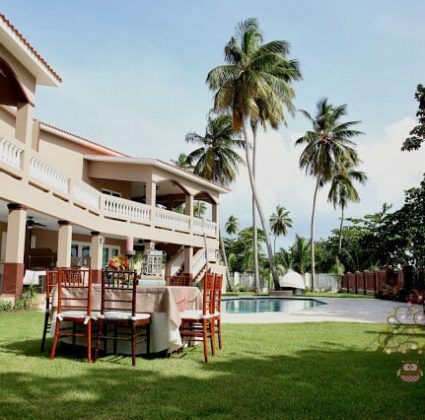 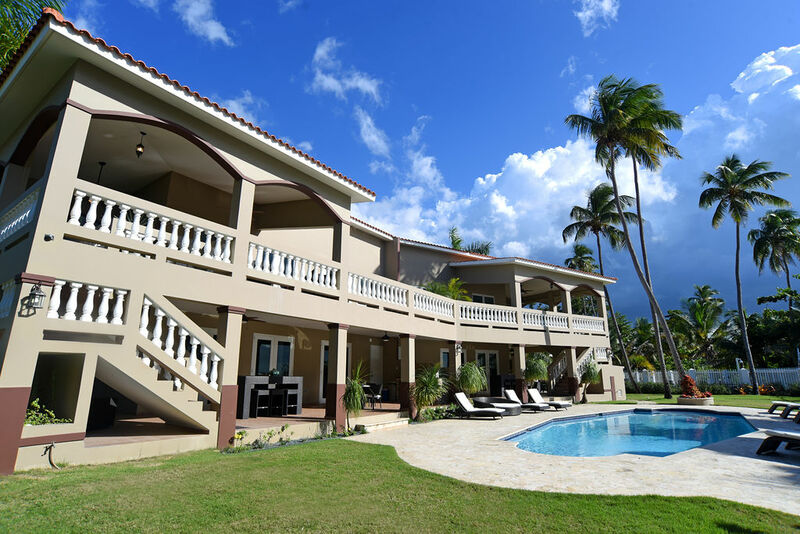 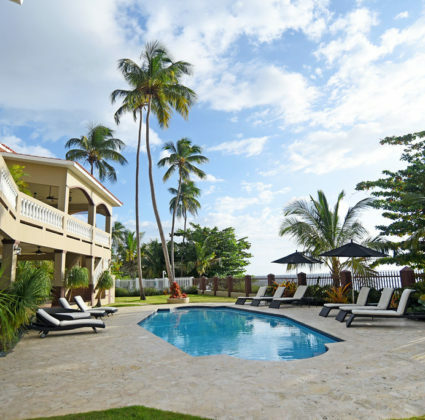 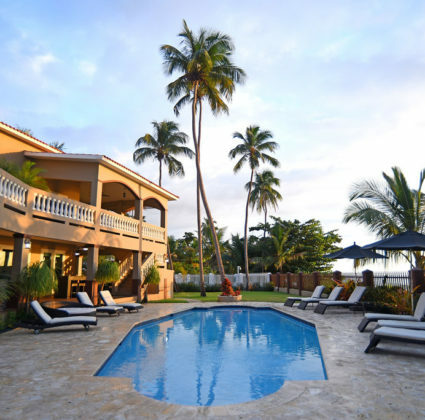 Consider renting an oceanfront estate, like Maria’s, to ensure better privacy. 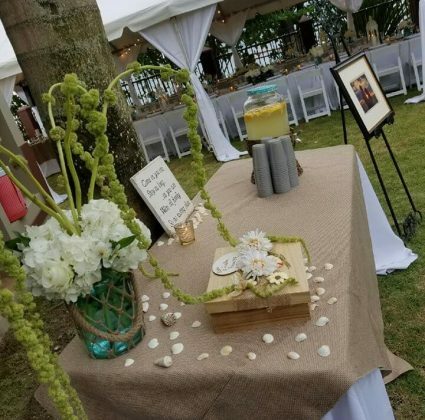 And, choosing local vendors for food, flowers, photography and favors helps to ensure that you’ll have what you need, when you need it. 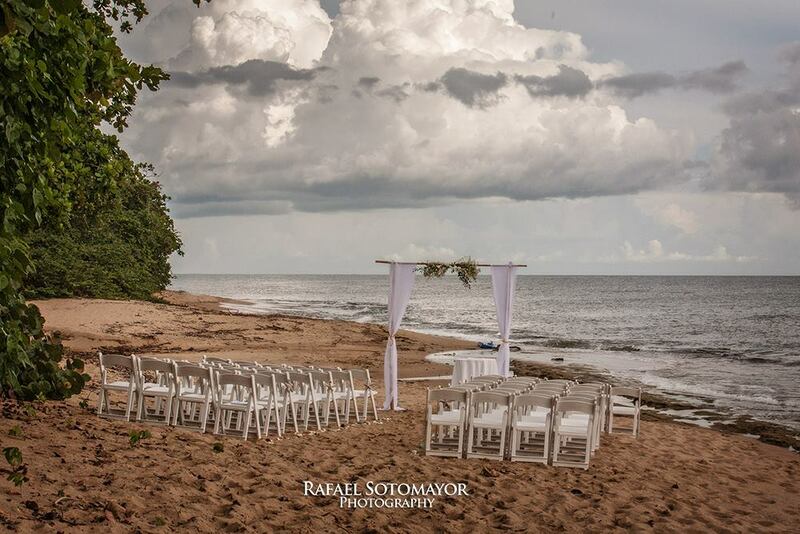 Talk About the Weather: Are you planning your wedding at a time when there could potentially be some rough weather? 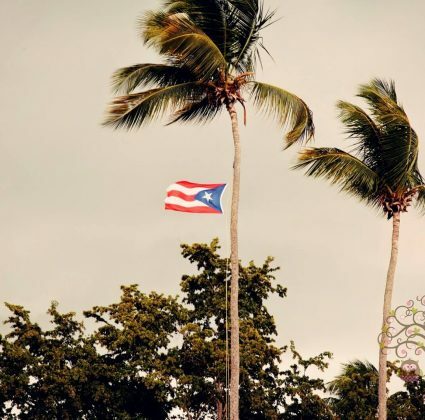 For instance, the rainy season in Puerto Rico takes place in the mid-summer through fall, and that’s also when hurricanes can occur. 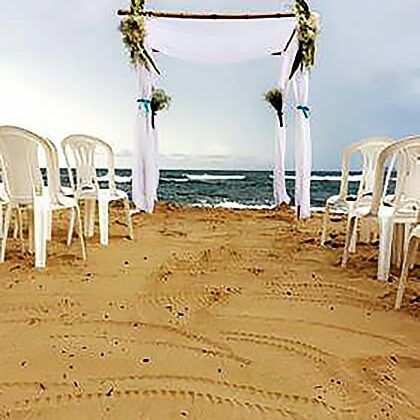 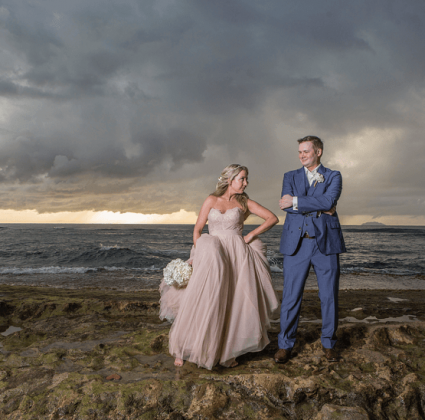 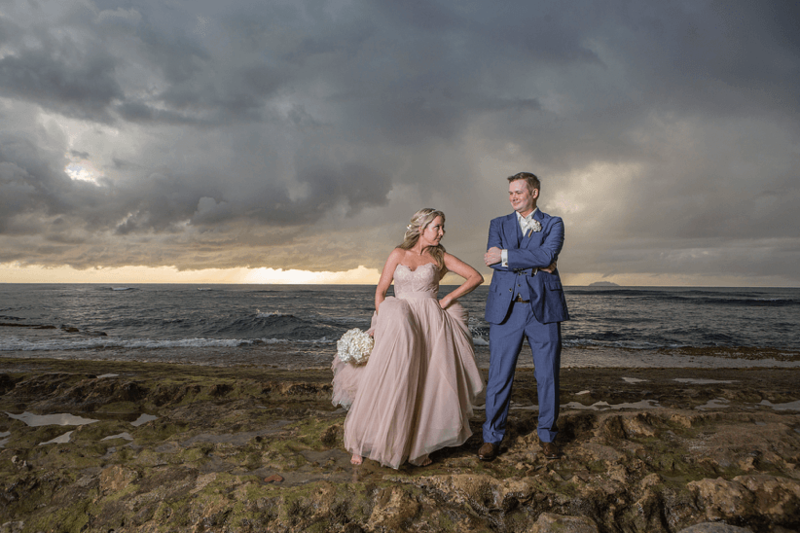 That being said, no matter what the season, weather is fickle, and that means that in spite of perfect planning, the day of your beach wedding can wind up being a rainy one. 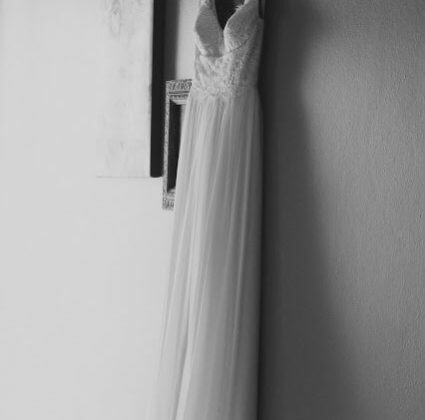 Have a backup plan. 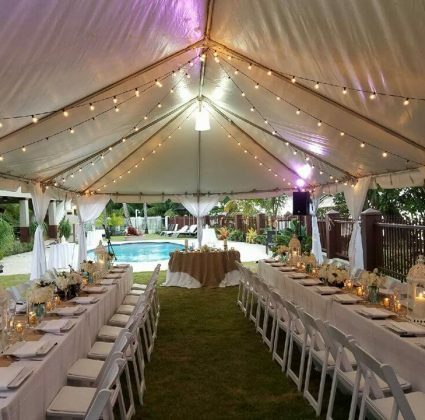 For light rain, having a canopy or tent ready will probably suffice, but you may want to make sure you have an indoor space available in case the weather gets severe. 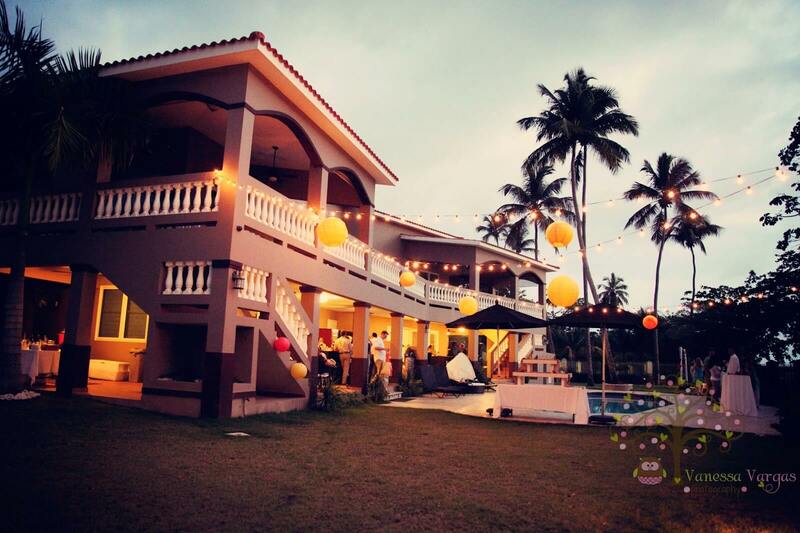 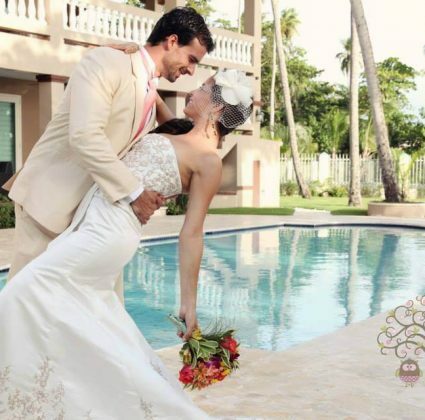 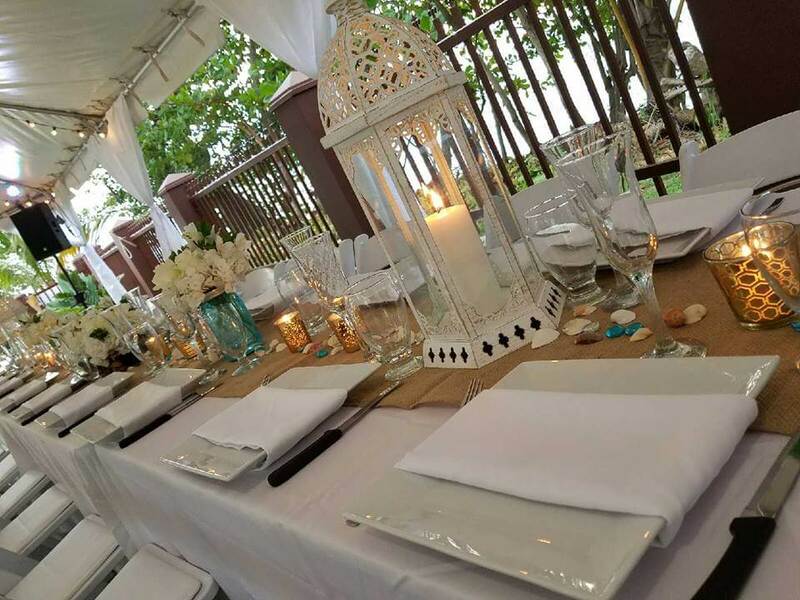 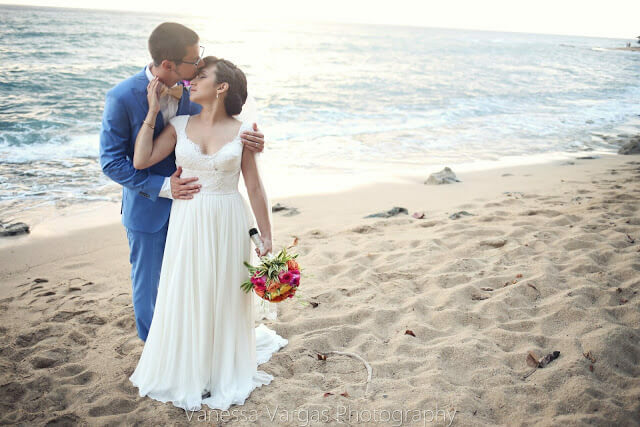 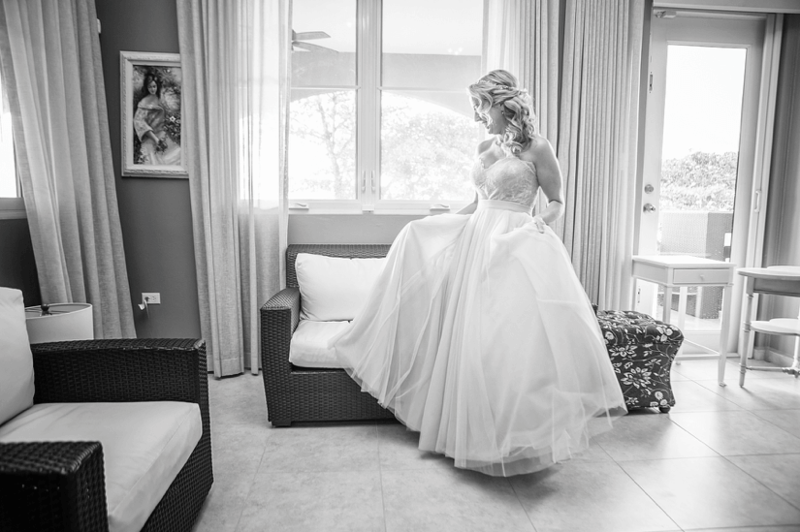 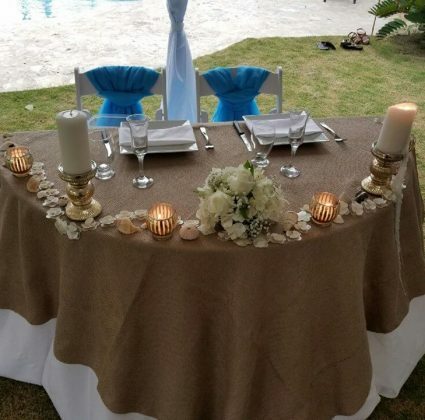 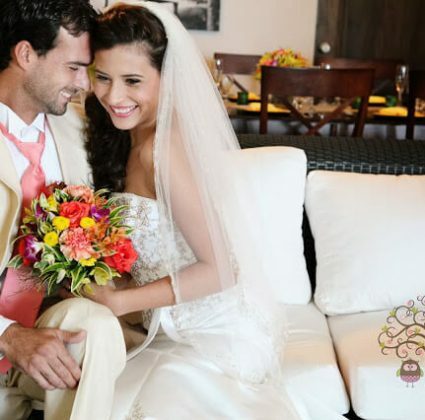 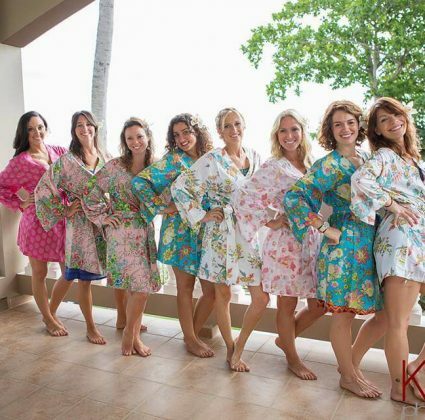 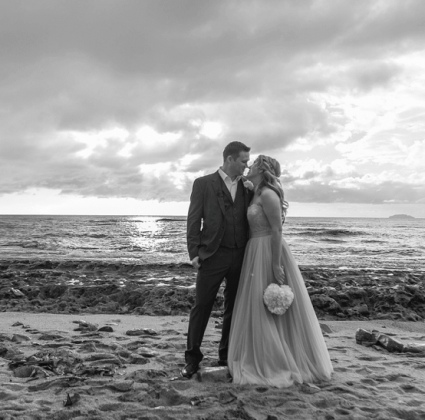 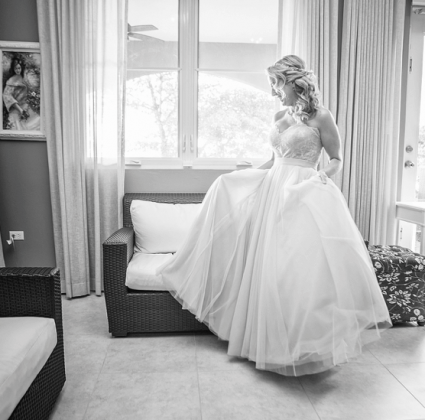 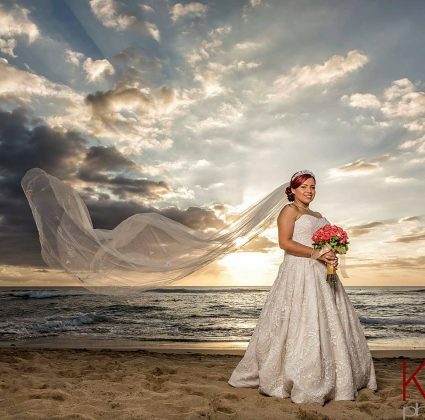 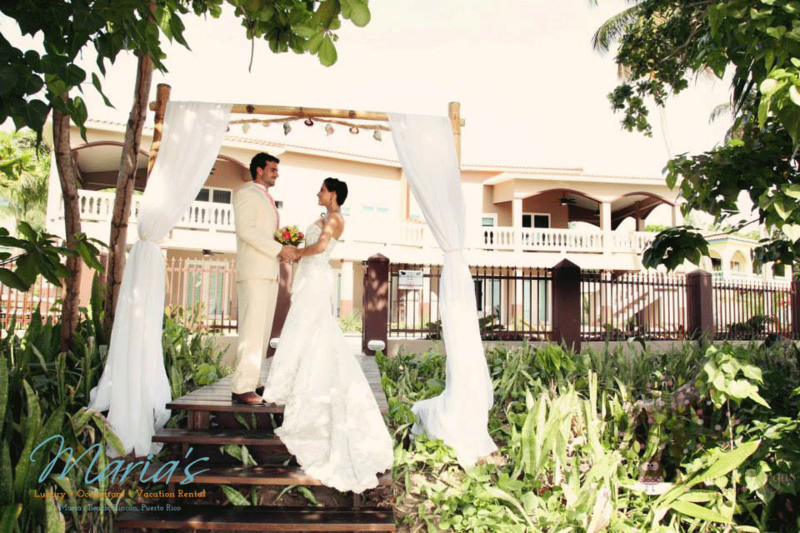 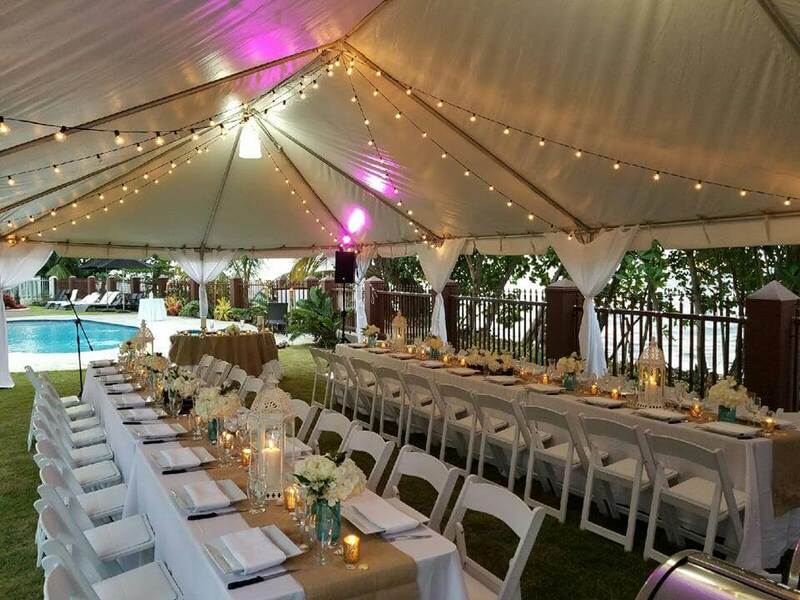 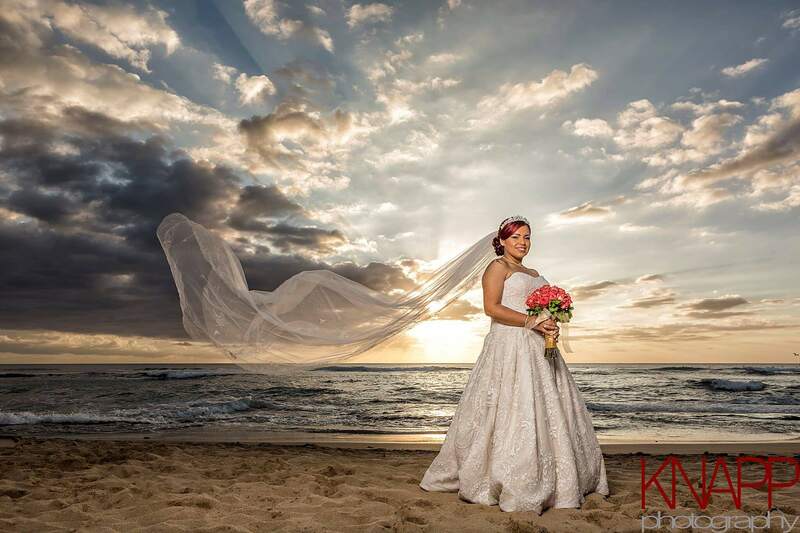 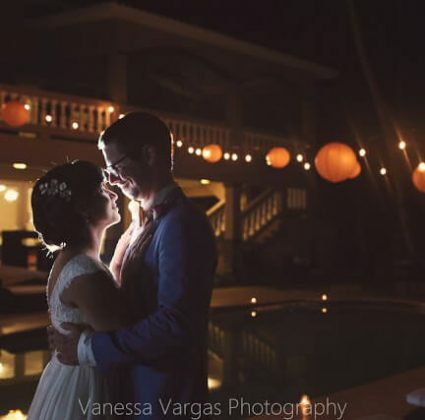 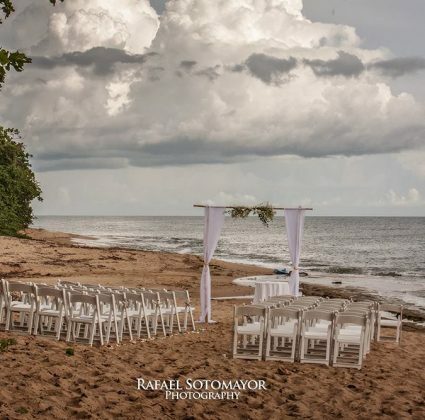 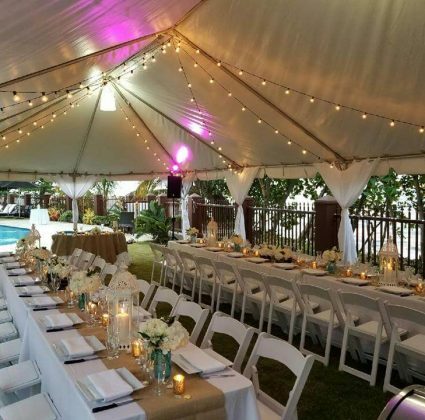 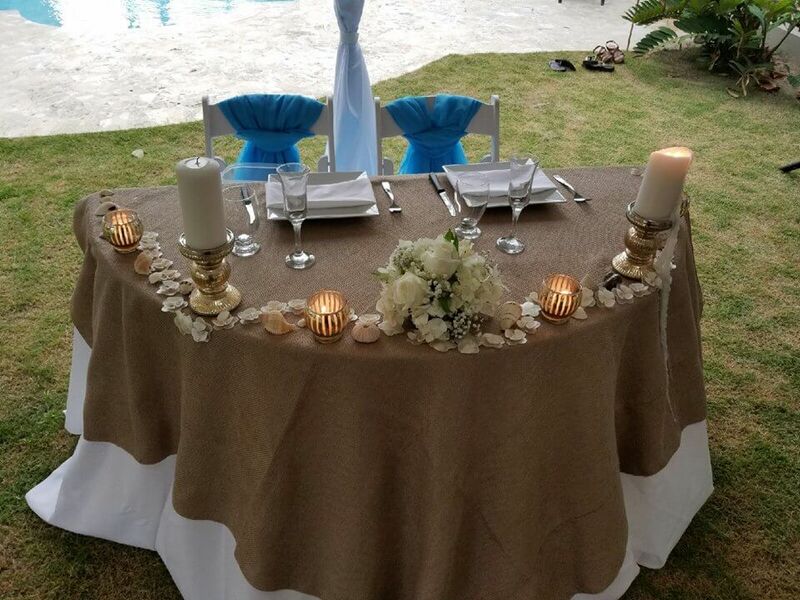 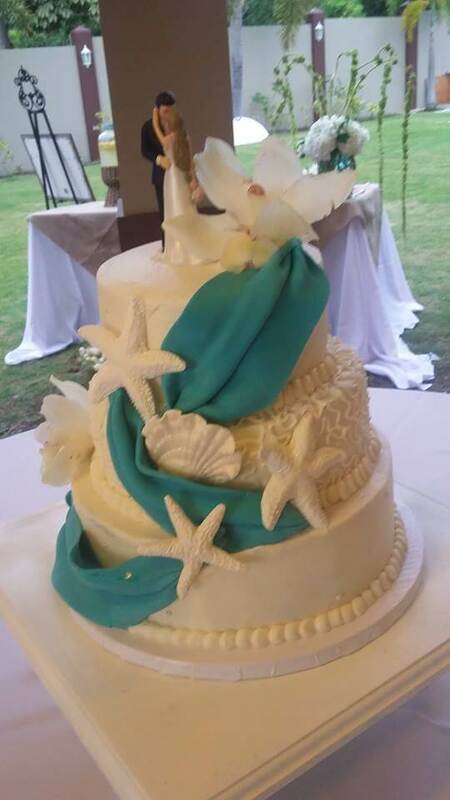 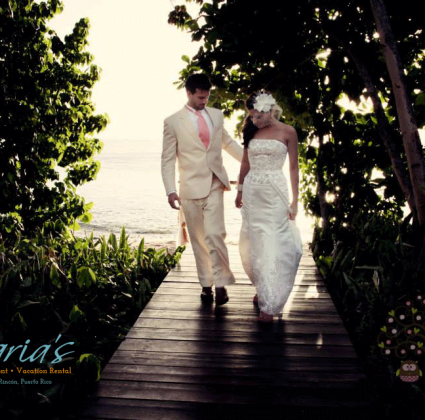 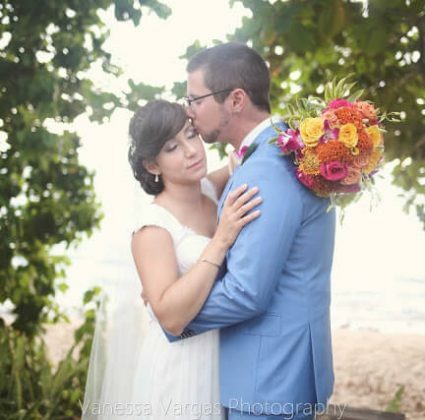 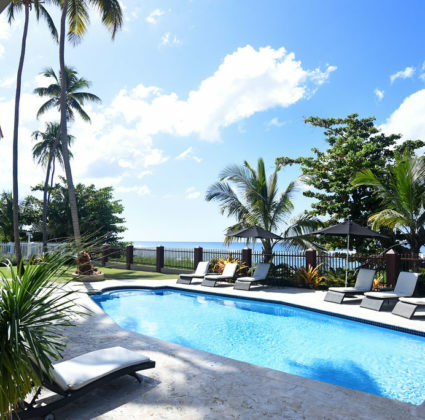 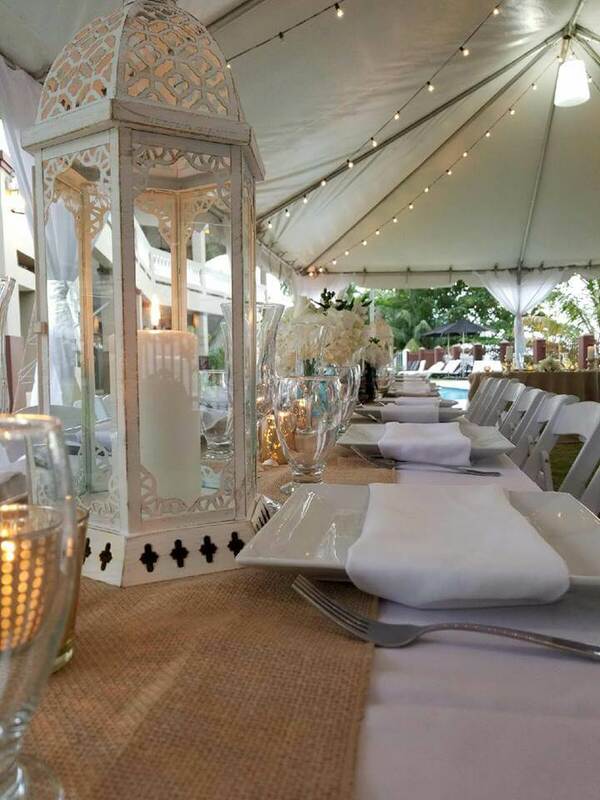 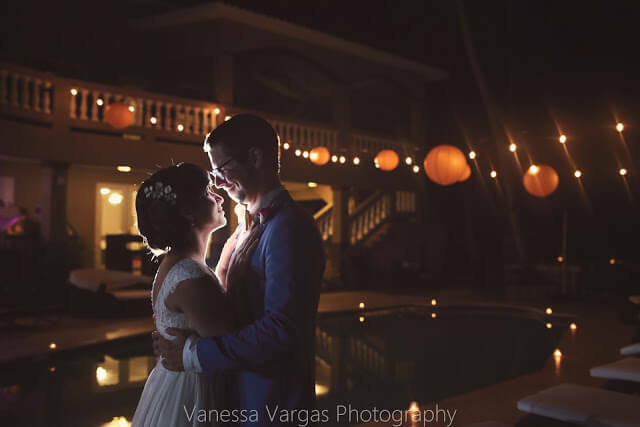 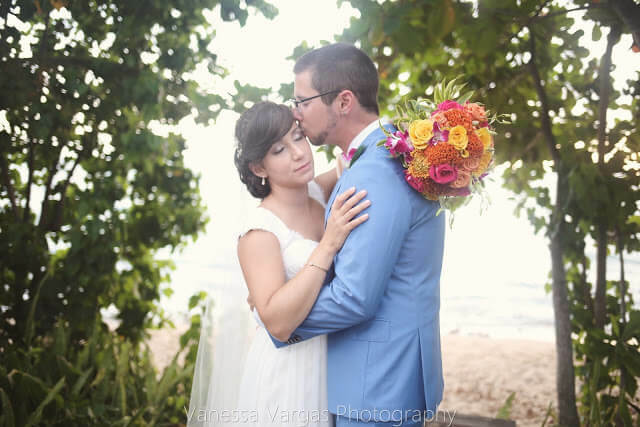 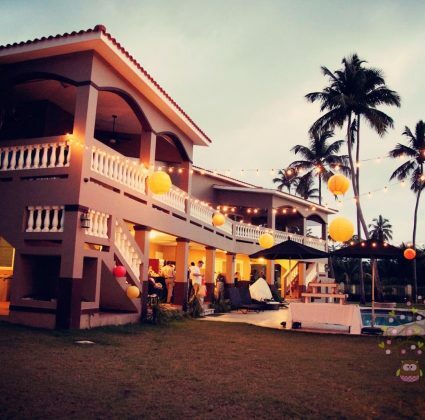 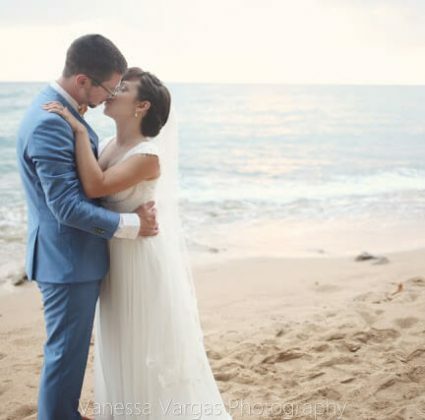 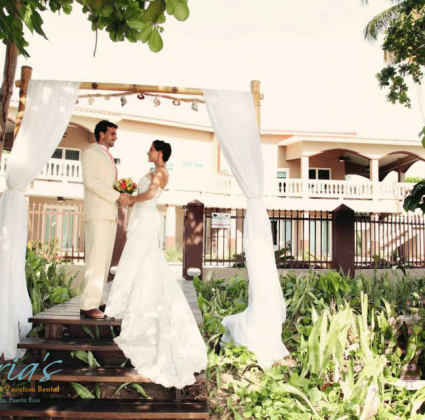 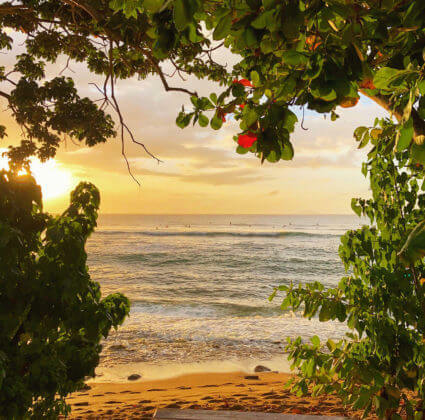 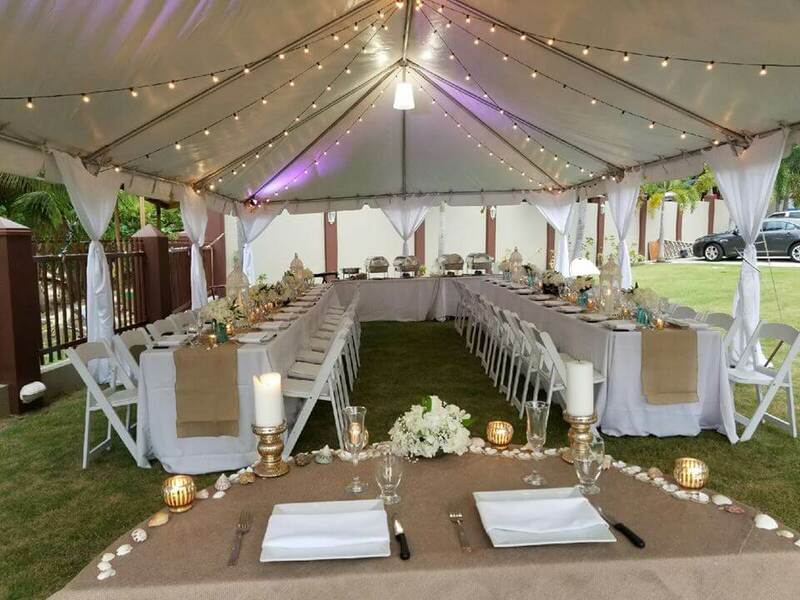 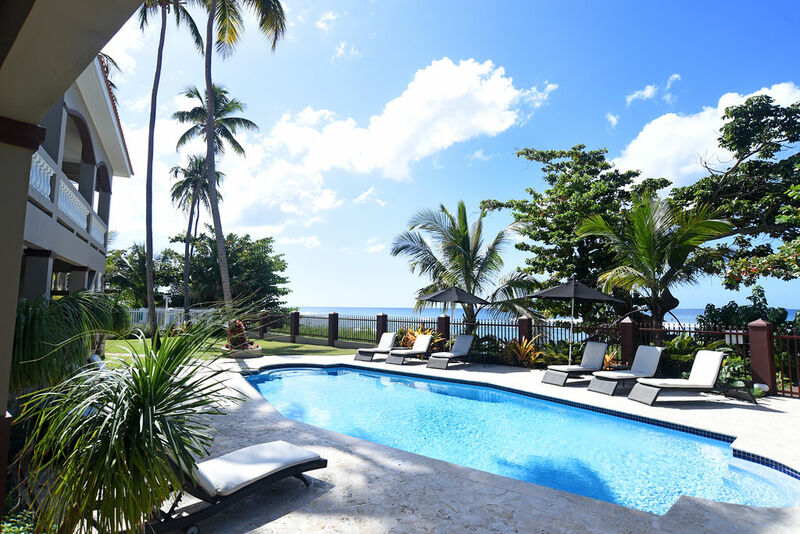 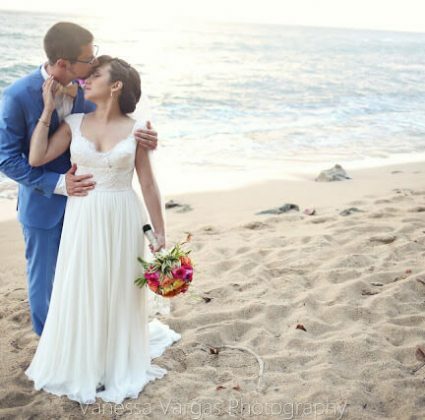 Most of all, when planning your beach wedding to Puerto Rico, relax, have fun, and choose a beautiful place to stay, like what we provide at Marias. 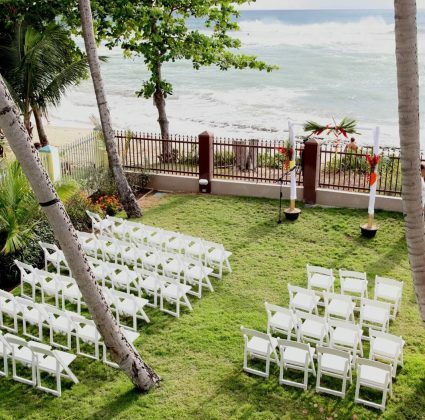 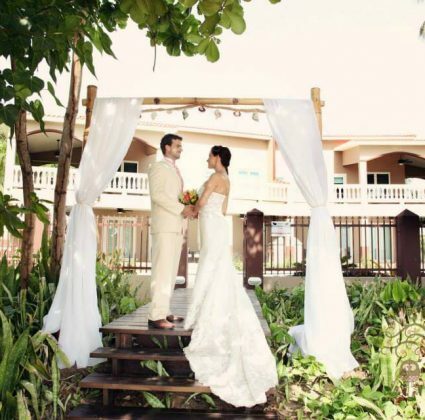 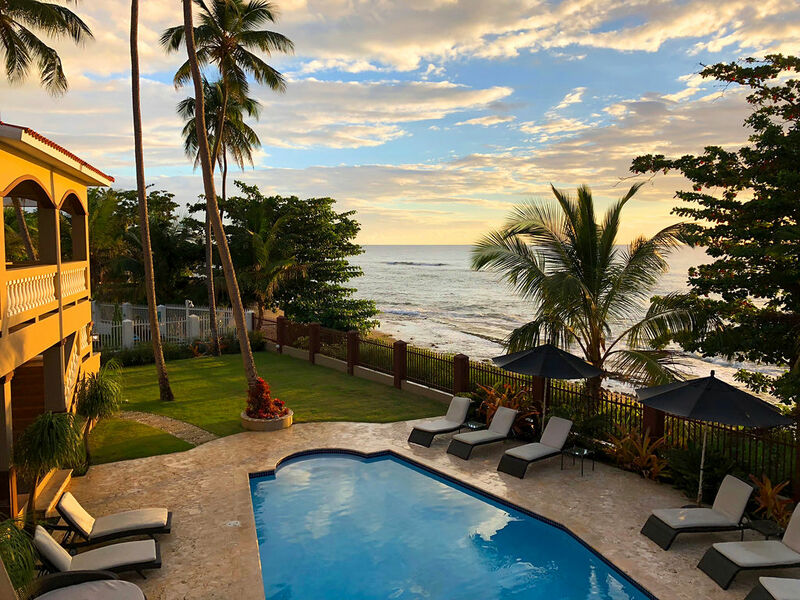 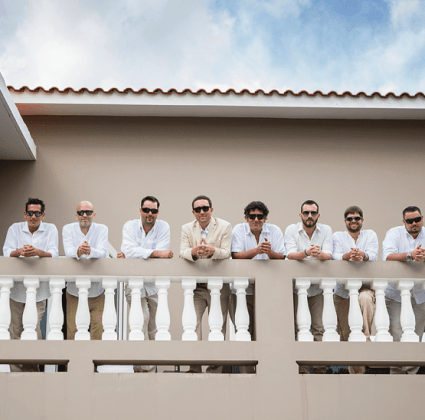 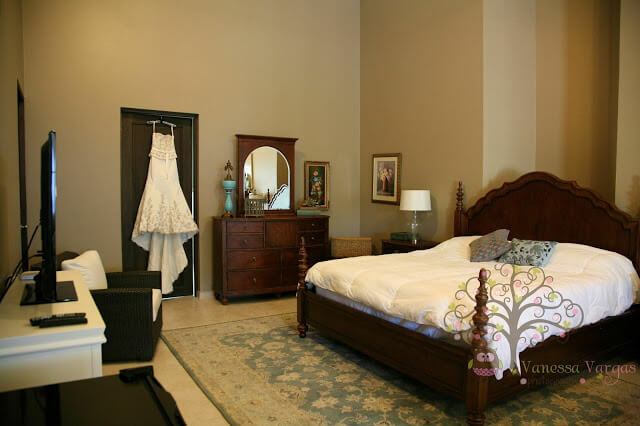 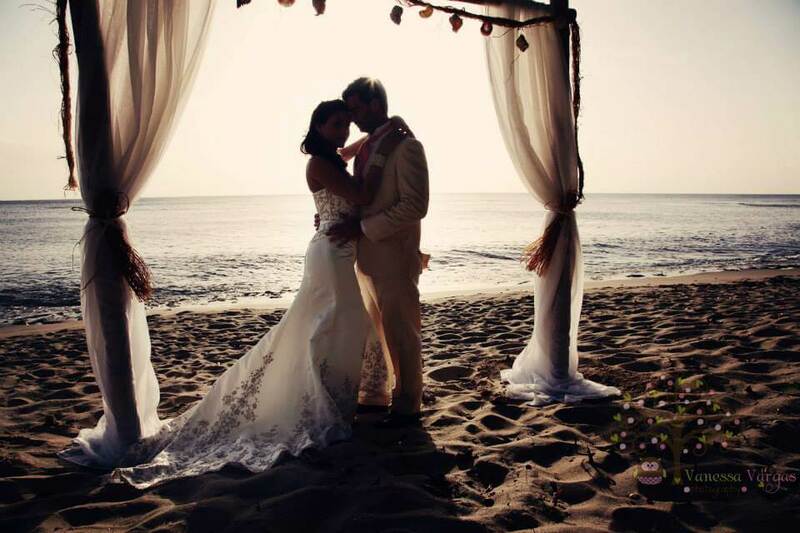 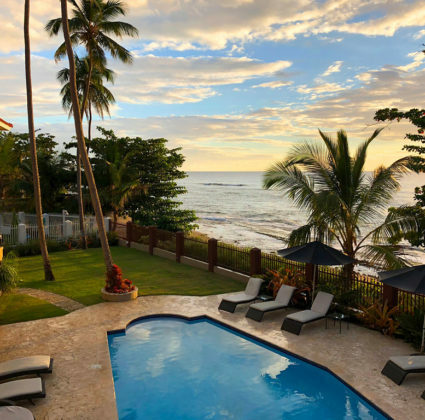 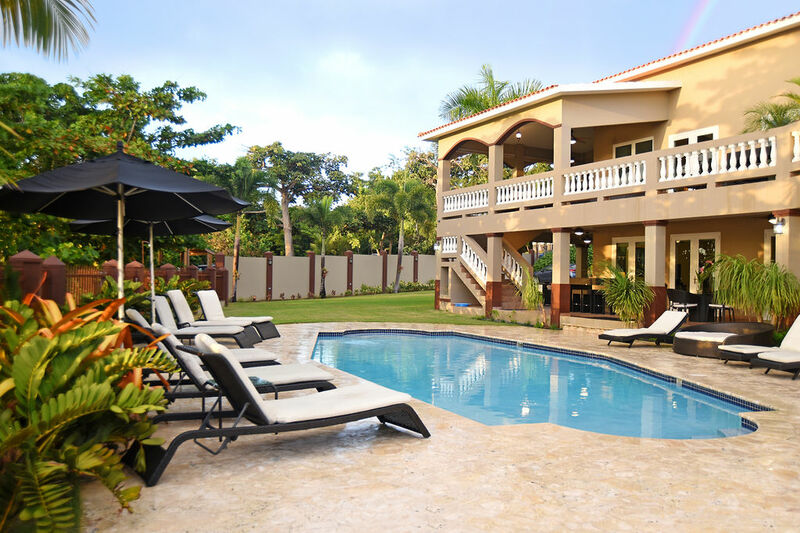 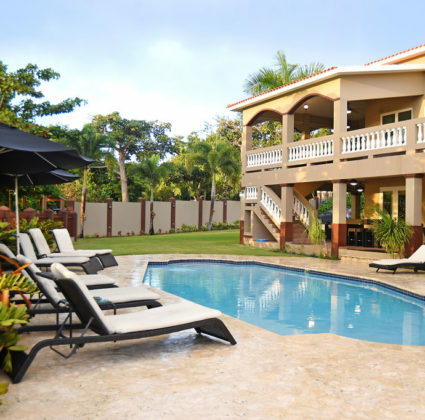 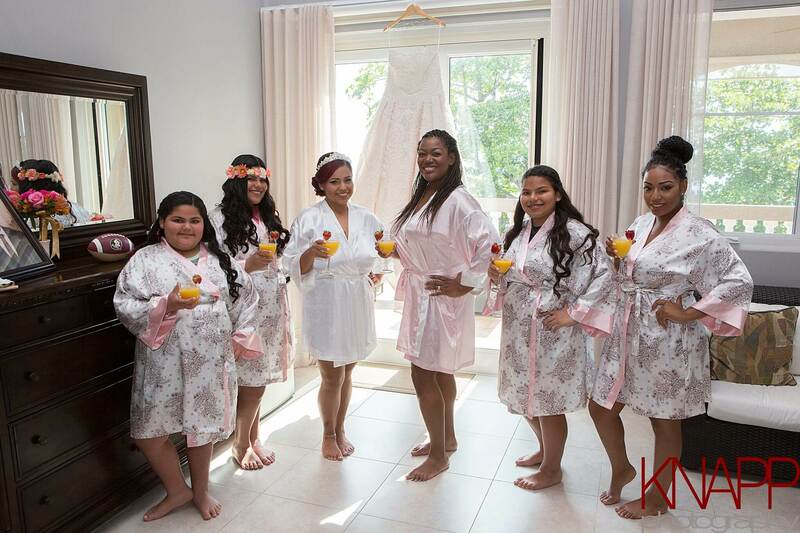 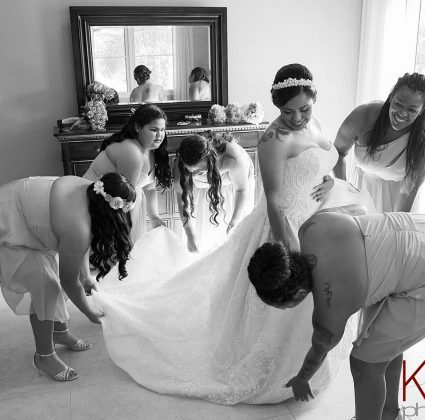 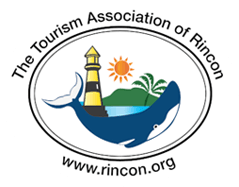 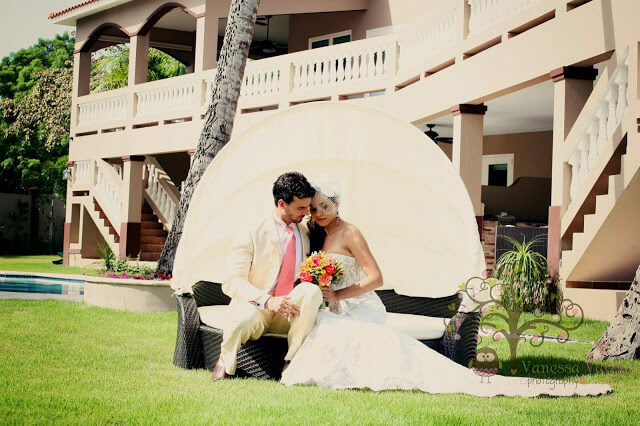 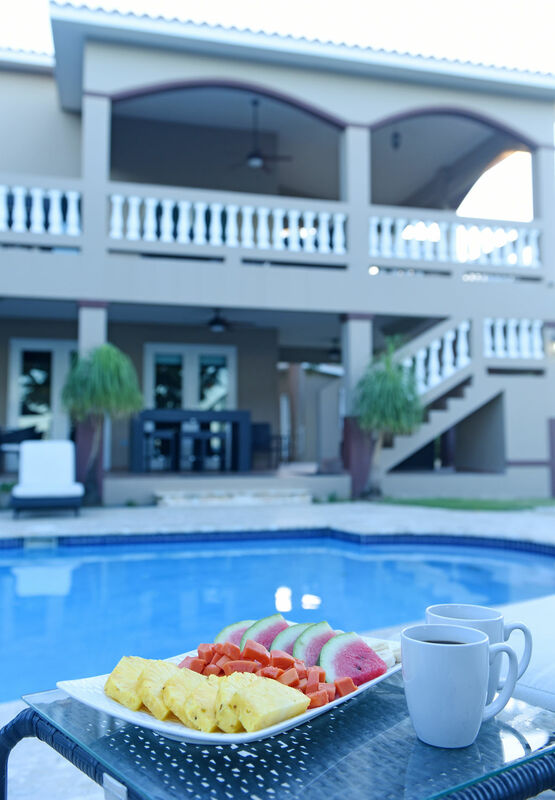 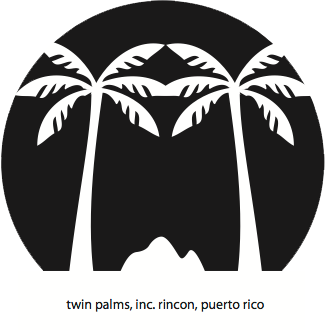 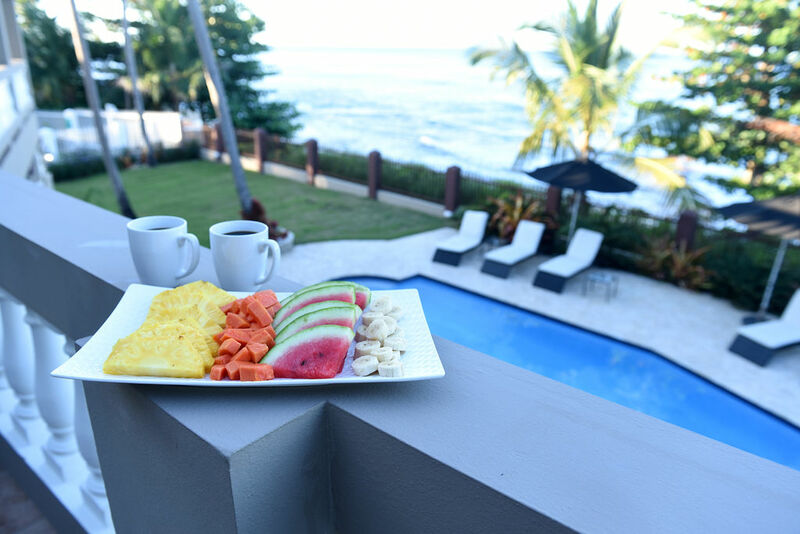 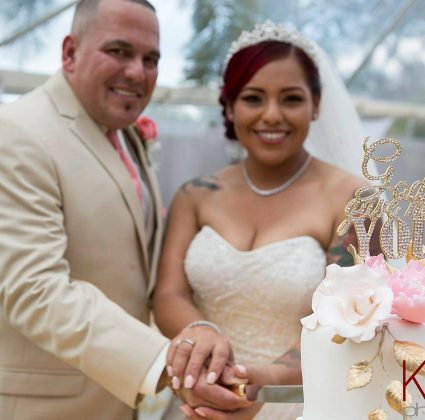 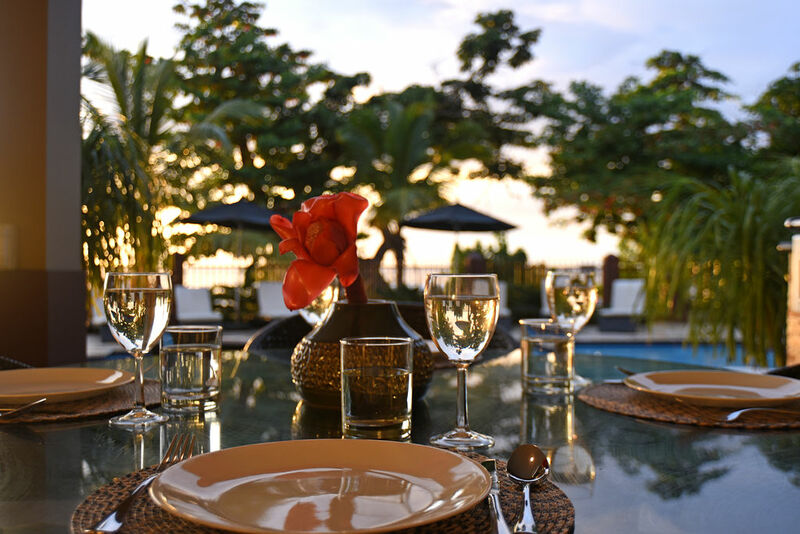 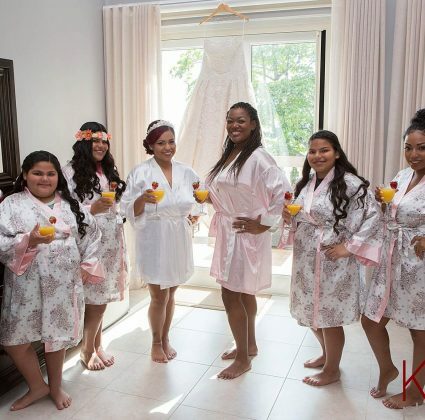 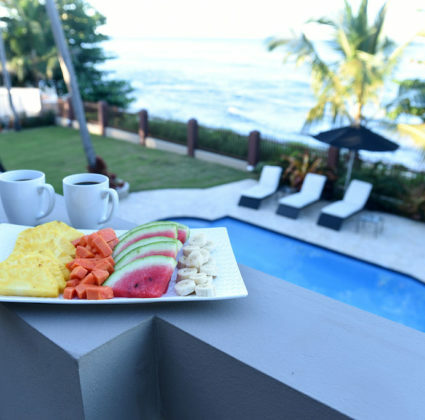 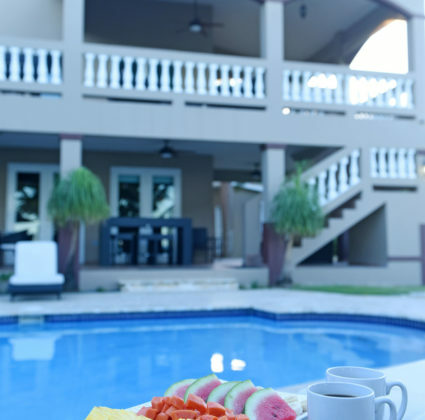 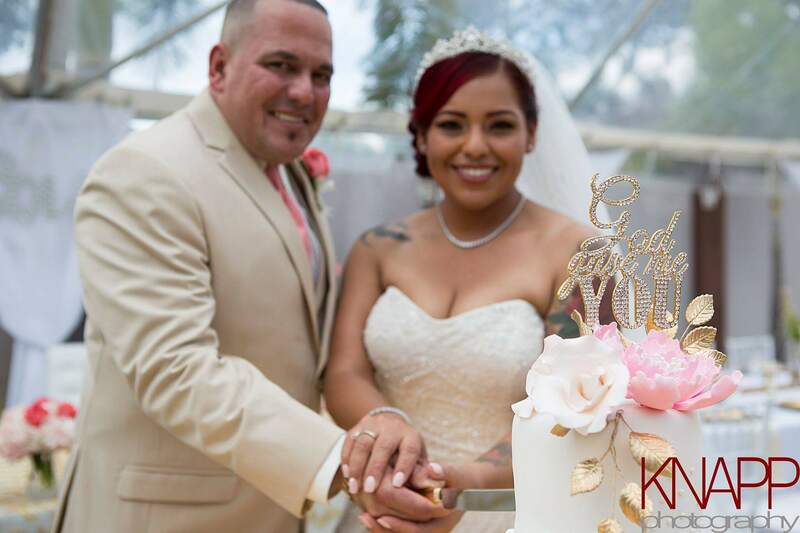 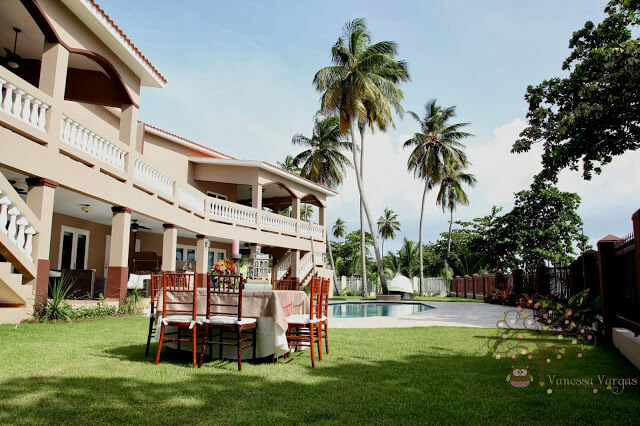 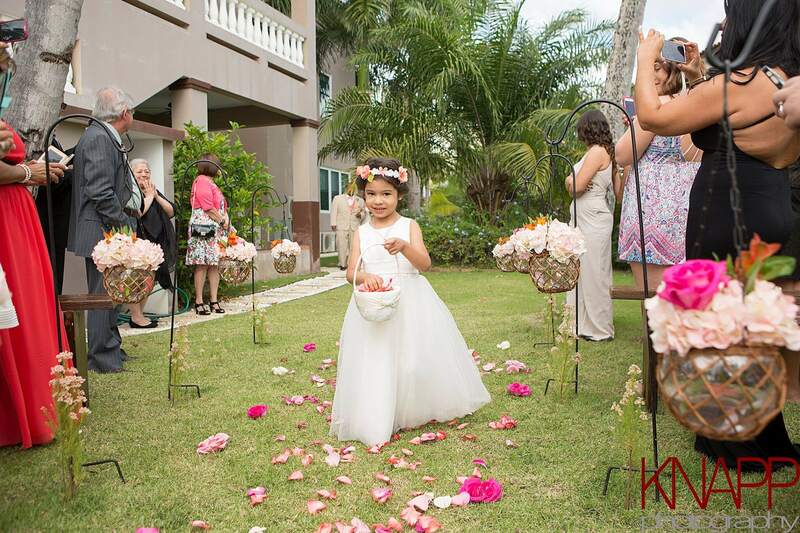 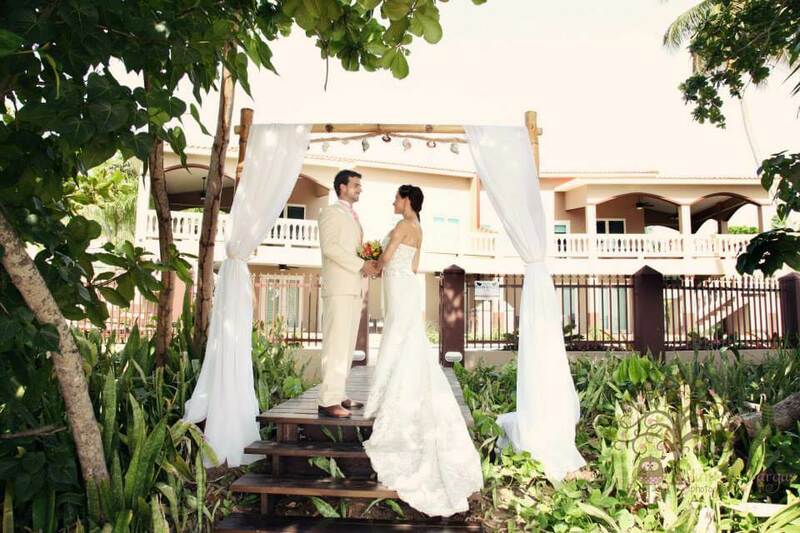 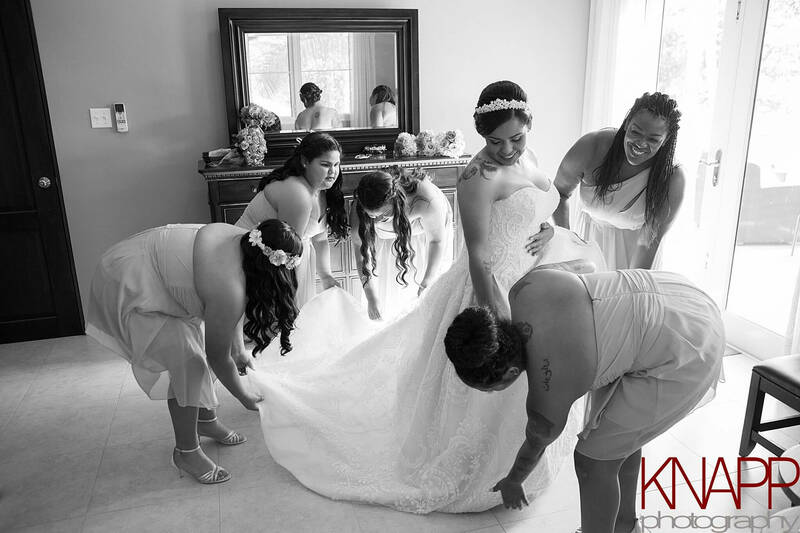 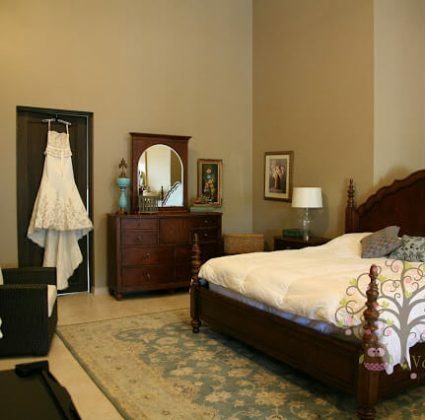 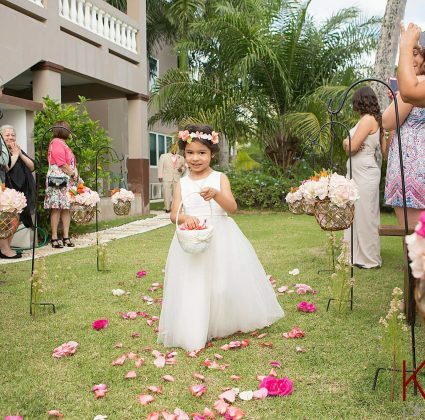 Not only do we offer complete luxury accommodations, we’re friendly, knowledgeable regarding weddings, and know Rincon like the back of our hands. 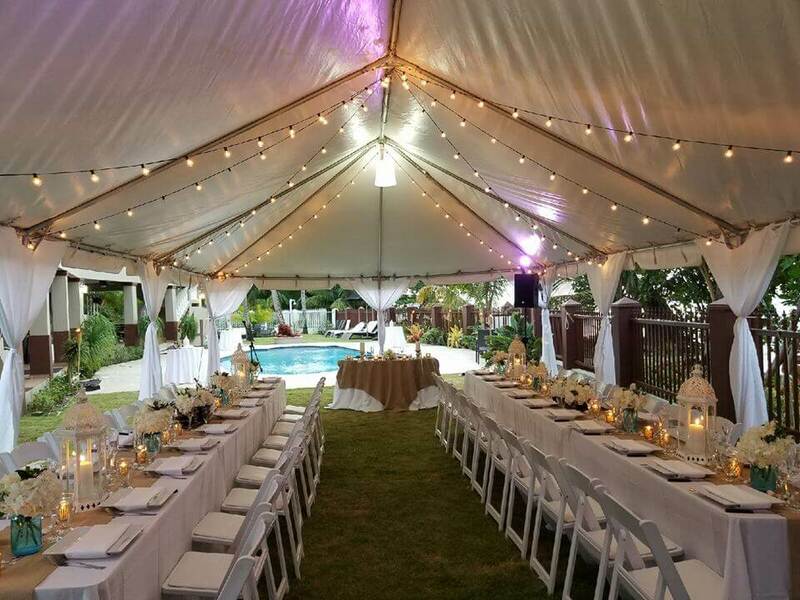 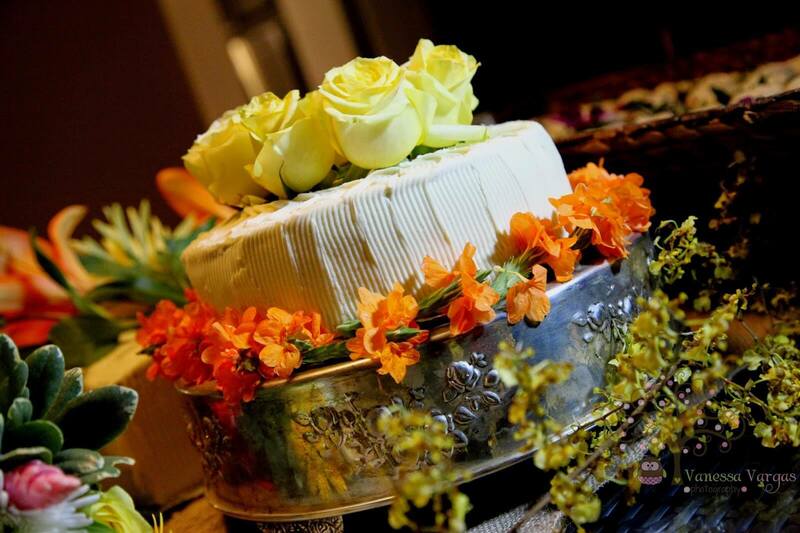 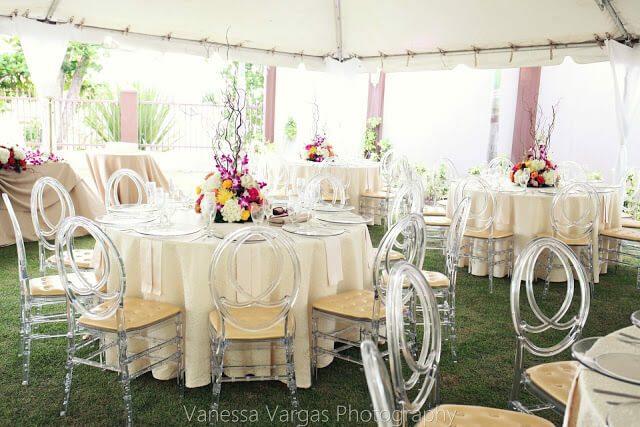 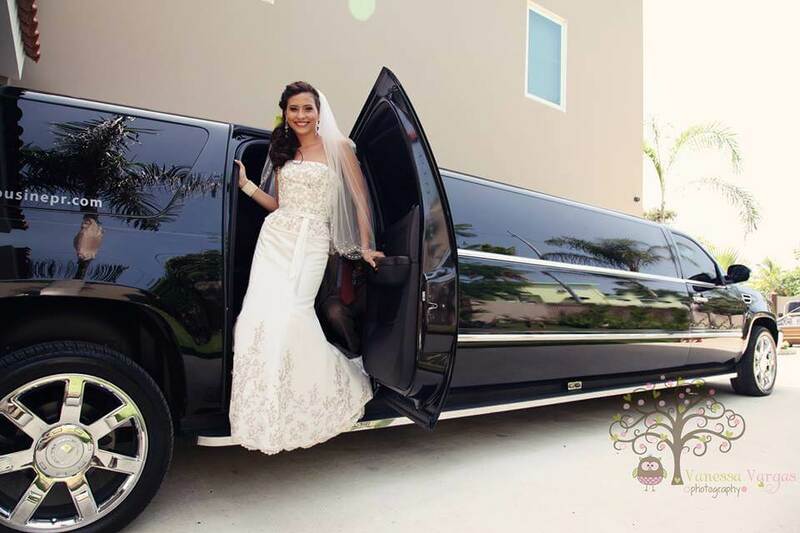 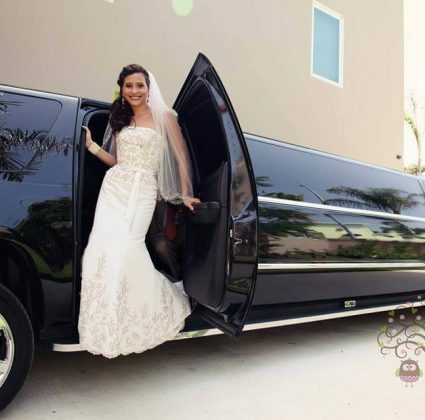 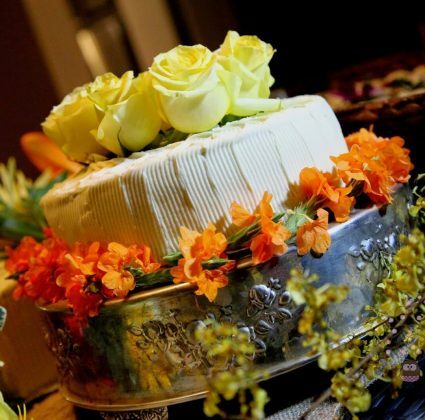 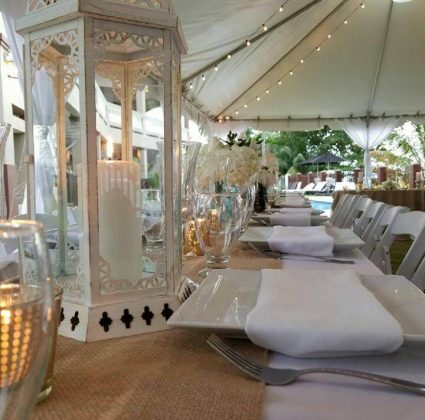 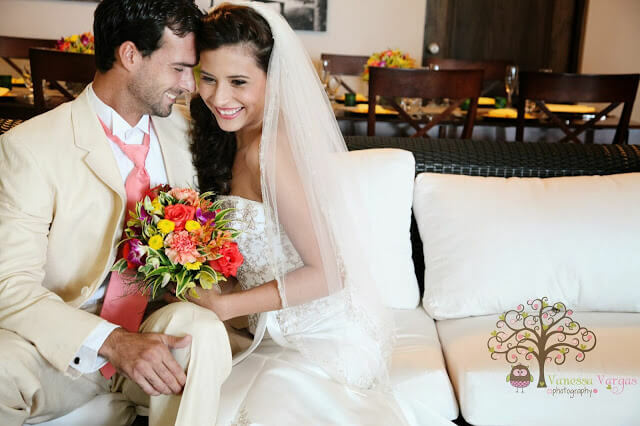 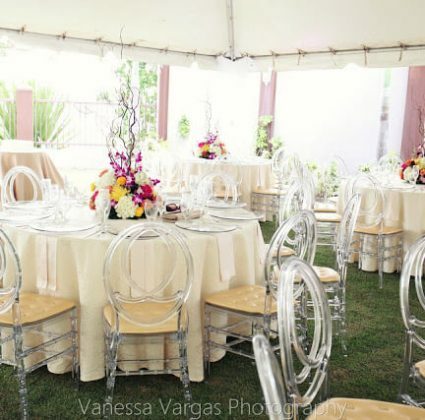 When you’re ready to start planning your wedding at Maria’s, give us a call at 787-685-6648 (español: 787-233-9815), or use our convenient online contact form to tell us more about you and your wedding plans. 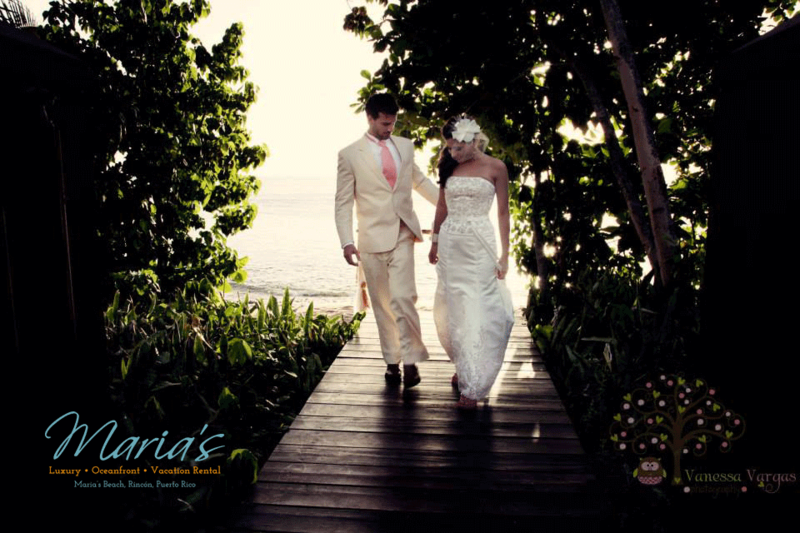 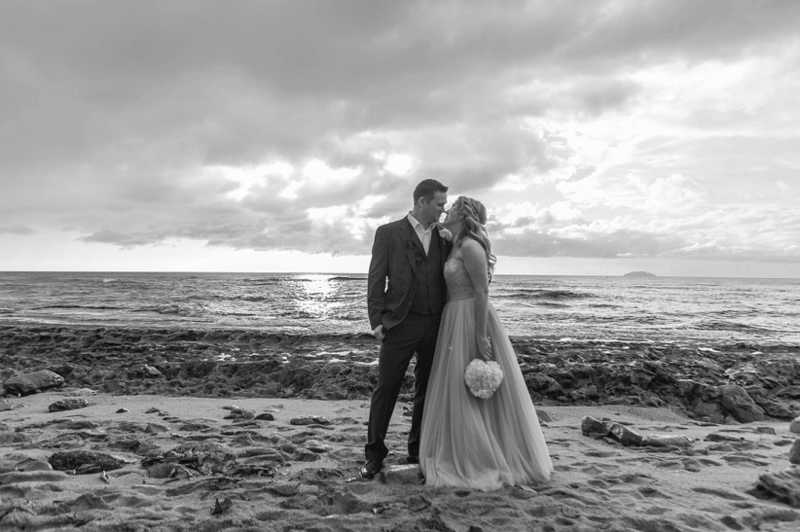 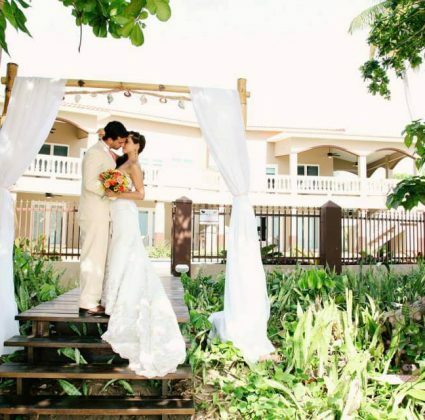 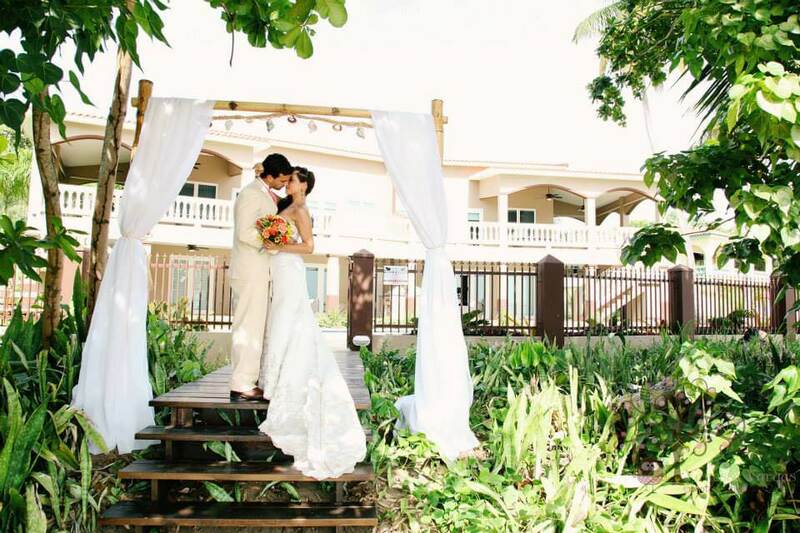 We look forward to helping you make your destination wedding a dream come true.